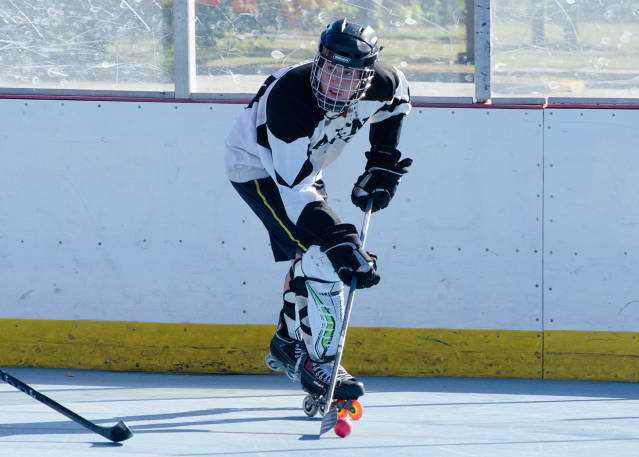 November 20, 2016 - AEN Asphalt rolled over Voodoo Grill in the regular season finale, due in large part to a 10 goal, 2 assist outing from Max Kneeland. Seamus Moran picked up 5 assists, and Seth Cohen put in 2 goals and an assist. Other Week 10 highlights include Nick Augusto with 4 goals and 2 assists as Smith's Acres defeats Navy Silent Snipers, Mike Hall with 5 goals and 2 assists as Sound Home Builders down Carl's Cronies, Aaron Stelik provides 4 goals and an assist as Hayes Services triumphs over Lost Souls, and Mike Adams provides a hat trick to Nowakowski Painting in their win over Electric Boat Athletic Club. 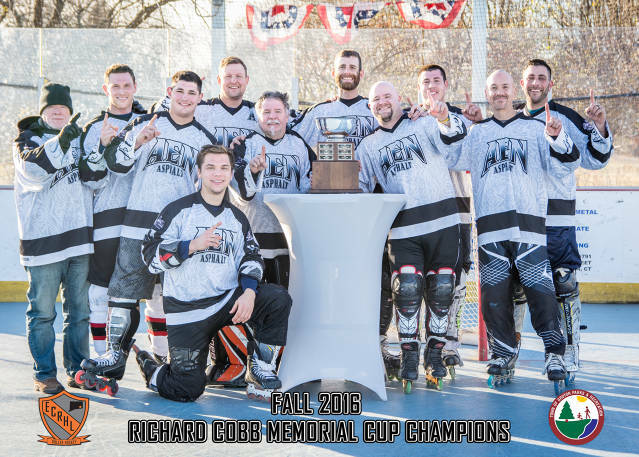 December 4, 2016 - Completing the 2016 sweep, AEN Asphalt captured their 4th Richard Cobb Memorial Cup Championship, downing Hayes Services in the finals. 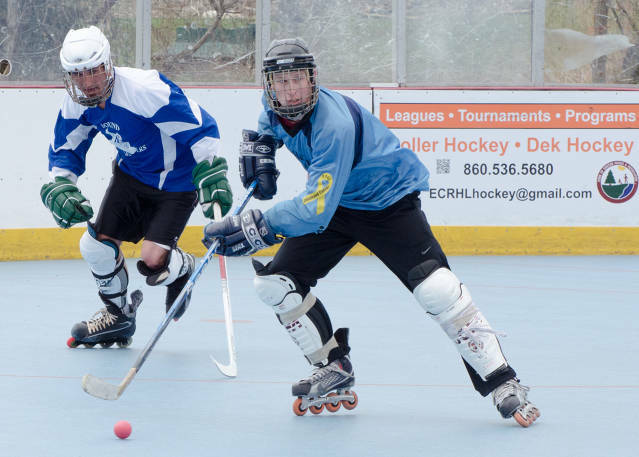 January 1, 2017 - The Spring 2017 Sunday Ball League season will commence on Sunday, April 2nd, as the Eastern Connecticut Roller Hockey League starts its fifth year, adding to a 21 year tradition of Roller Hockey in Groton, Connecticut. 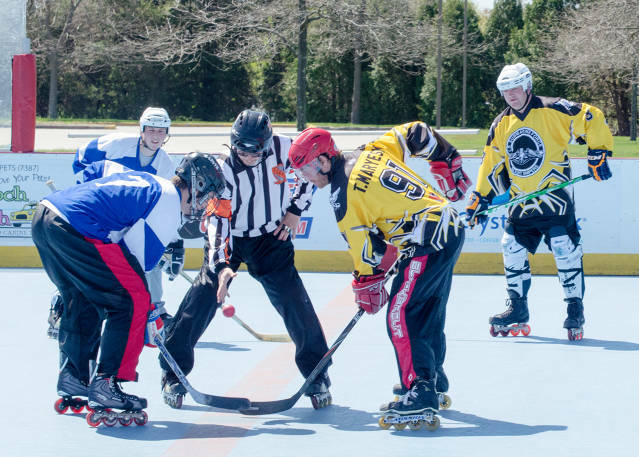 If you would like to be a part of the excitement - players, referees and scorekeepers are needed! Contact us at ECRHLhockey@gmail.com or click the Contact Us icon in the left menu. 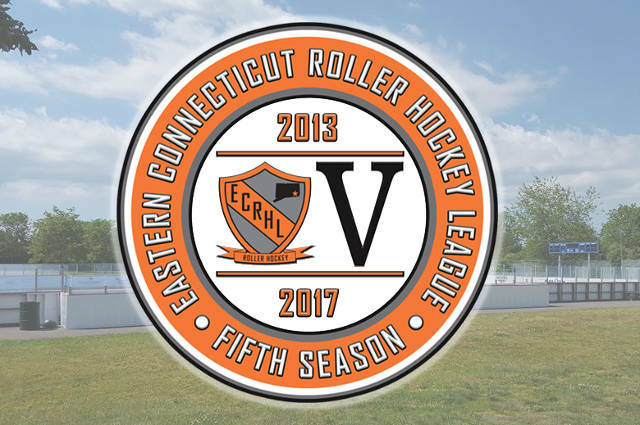 March 26, 2017 - The Eastern Connecticut Roller Hockey League has released the full schedule for the upcoming Spring 2017 Sunday Ball League. 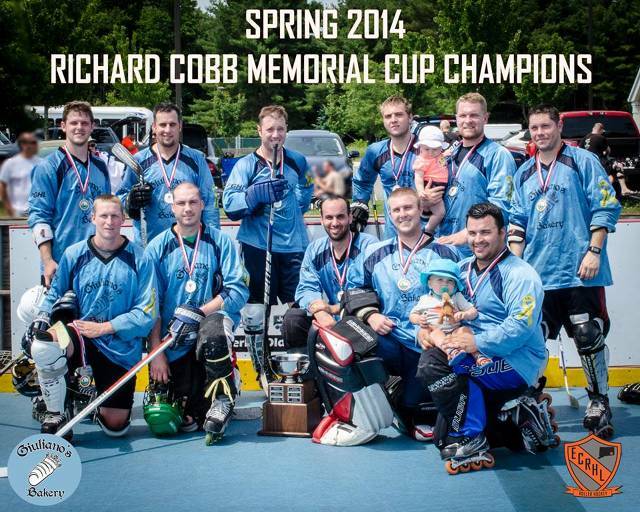 The first of ten regular season matchups for the ten teams vying for the right to hoist the Richard Cobb Memorial Cup will be held on Sunday, April 2nd, as the second half of Hockey Weekend in Groton. Admission is free to watch and the public is always welcome at the Groton Hockey Rink, located at 102 Newtown Road in Groton. April 2, 2017 - In a rematch of the Fall 2016 Sunday Ball League championship game, AEN Asphalt prevailed once again over Hayes Services, led by Max Kneeland's hat trick and assist. Tied at two halfway into the third period, Kneeland provided the game winner on an assist from Chris Turner (2A). An empty net goal from Brett Skibba (2G) with 11 seconds left in the game sealed the win for the defending Richard Cobb Memorial Cup champions. 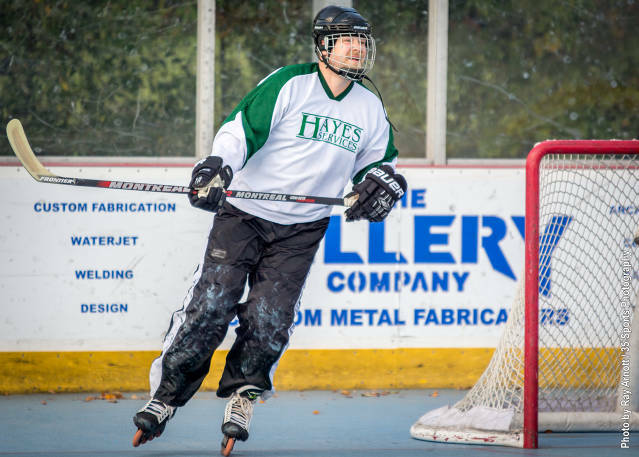 Hayes Services' Adam Keefe scored 2 goals in the losing effort. Other Week 1 highlights include Jeff Estrella's hat trick as EBAC shut out Nowakowski Painting, Navy Silent Snipers' Andrew Sacco with a goal and assist in his team's first victory since October 2, 2016, Jimmy Cerino scored 2 goals and an assist as Voodoo Grill edged Smith's Acres, and Sound Home Builders' AJ Ray (3G, 3A) and Chris Drakos (3G, 3A) each providing 6 point games in their team's win over Carl's Cronies. 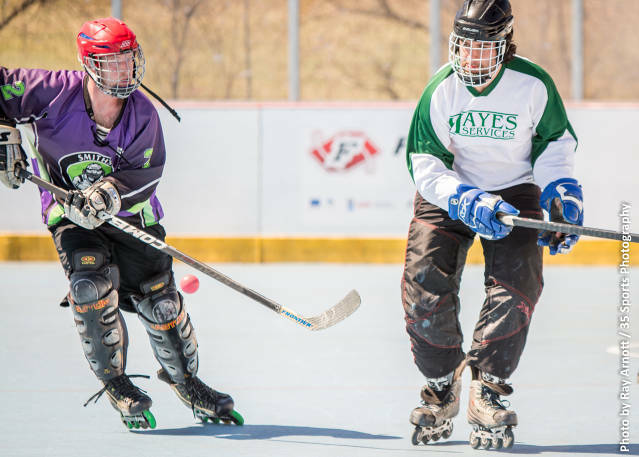 April 9, 2017 - With both Hayes Services and Smith's Acres coming off narrow defeats in Week 1, both teams put up a strong defensive game, limiting the game to just 24 shots total, and drawing to a 6 - 6 tie. Brian Discordia led Hayes Services with 3 goals and 1 assist, while Smith's Acres Joe Forte provided 2 goals and 2 assists. Other Week 2 highlights included Erik Faxon providing 5 goals to Carl's Cronies in a rout of Lost Souls, Voodoo Grill's Jimmy Cerino tallying 2 goals and 3 assists in his team's win over Nowakowski Painting, Matt Singer's hat trick for Electric Boat Athletic Club as they cruised over Navy, and AEN Asphalt's Greg Felber providing 3 goals and 3 assists in a rout over Sound Home Builders. November 13, 2016 - Nowakowski Painting team captain Josh Lecy provided his team with 2 goals and an assist in the win over Lost Souls. Brandon Cline added 2 goals and Brian Bonewicz contributed with a goal and an assist. Other Week 9 highlights include Max Kneeland with 2 goals and 2 assists as AEN Asphalt edges Sound Home Builders in overtime, Brian Discordia with 5 goals as Hayes Services rolls over Voodoo Grill, Nick Augusto tallying a hat trick for Smith's Acres in their victory over Electric Boat Athletic Club, Josh Chouinard with 2 goals, 1 assist as Carl's Cronies down Navy Silent Snipers, and Chris Discordia with 5 goals as Hayes Services prevails over Electric Boat Athletic Club. 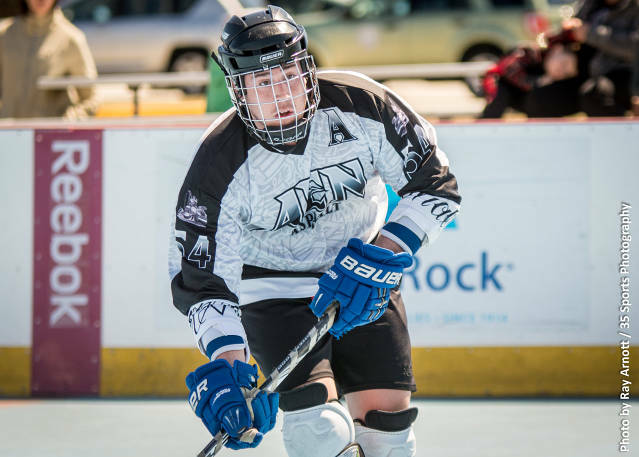 November 12, 2016 - Max Kneeland (2G, 4A) led AEN Asphalt with 6 points as his team defeated rival Sound Home Builders 10-6. Brett Skibba chipped in with a hat trick and 2 assists, while Greg Felber provided a hat trick of his own. Other Week 8 highlights include Adam Duczynski with 2 goals, 2 assists as Smith's Acres defeats Electric Boat Athletic Club, Brian Discordia (5G, 5A) with 10 points in Hayes Services rout of Voodoo Grill, Chris Simpkins with a goal and 2 assists as Carl's Cronies edge Navy Silent Snipers, and Josh Lecy with a goal and 2 assists in Nowakowski Painting's tie with Lost Souls. November 6, 2016 - Andrew Peck supplied Carl's Cronies with a hat trick plus assist, leading to a 10-5 victory over Electric Boat Athletic Club. Joe Haskins tallied 2 goals and 3 assists, and Kurt Knuijt provided 3 assists. 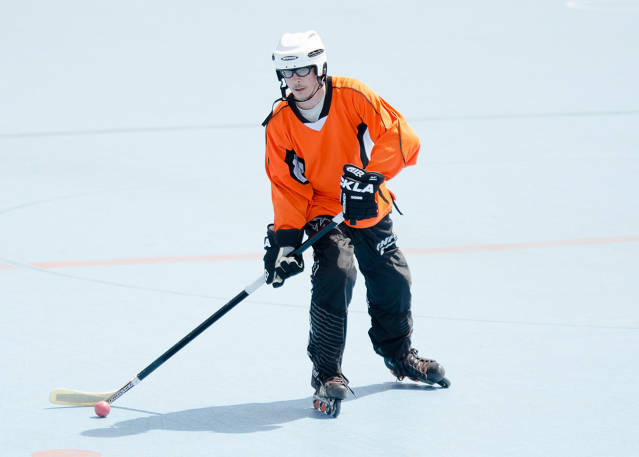 Other Week 7 highlights include Max Kneeland with 4 goals and 3 assists as AEN Asphalt sank Navy Silent Snipers, Jimmy Cerino with 3 goals and 4 assists in Voodoo Grill's win over Nowakowski Painting, and Brian Discordia with 5 goals, 2 assists for Hayes Services, who defeated Smith's Acres. Lost Souls vs. Sound Home Builders was rained out and will be made up later in the season. 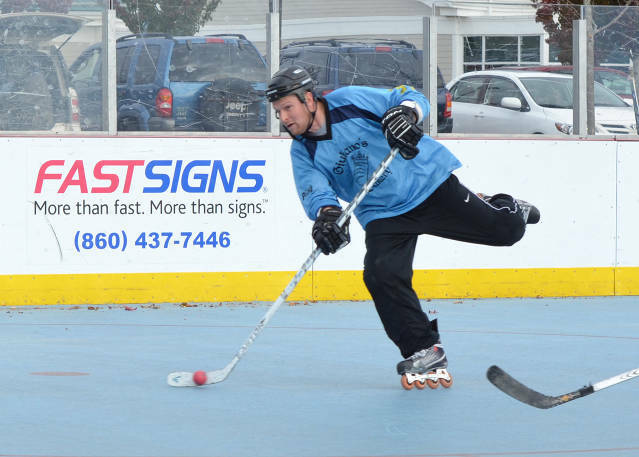 October 30, 2016 - Smith's Acres' Adam Duczynski provided 2 goals and 1 assist as his team prevailed over Nowakowski Painting 4-2. Colby Castro joined in with 1 goal and 1 assist and Matt Rei added a goal in the win. Nowakowski Paining goaltender Craig Stedman made 36 outstanding saves in the losing effort. Other Week 6 highlights include Brian Discordia with 3 goals, 3 assists as Hayes Services defeats Carl's Cronies, Max Kneeland's 5 goal, 5 assist outing as AEN Asphalt blanks Lost Souls, Jimmy Cerino with 6 goals and 2 assists in Voodoo Grill's defeat of Navy Silent Snipers, and Mike Hall leading Sound Home Builders over Electric Boat Athletic Club with 5 goals and 4 assists. October 23, 2016 - Jimmy Cerino provided a 3 goal, 2 assist outing to Voodoo Grill who edged Smith's Acres 6-5. Justin Maryeski contributed with 2 goals and 1 assist, and Todd Poquette added 2 assists in the win. 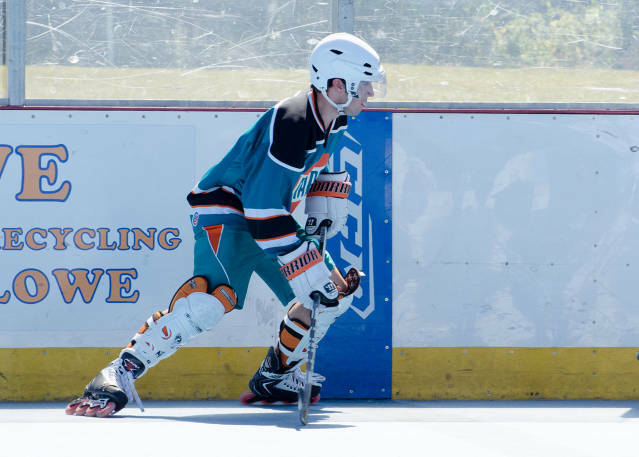 Other Week 5 highlights include AJ Ray (7G, 4A) with a 12 point outing as Sound Home Builders cruise over Navy Silent Snipers, Greg Felber with a hat trick and 2 assists in AEN Asphalt's win over Carl's Cronies, Brian Discordia tallying 5 goals, 3 assists as Hayes Services beats Nowakowski Painting, and Shaun Schaeffer with 3 goals, 3 assists in Electric Boat Athletic Club's win over Lost Souls. October 16, 2016 - Chris Drakos and Scott Webster both tallied a hat trick plus assist as Sound Home Builders doubled up Hayes Services by a score of 10-5. Tyler Haling also picked up a hat trick of his own in the victory. Other Week 4 highlights include Max Kneeland with 6 goals as AEN Asphalt defeats Nowakowski Painting, Adam Duczynski with 3 goals, 4 assists for Smith's Acres in their win over Lost Souls, Jeff Estrella tallying 2 goals and 2 assists as Electric Boat Athletic Club bests Navy Silent Snipers, and Jimmy Cerino with 4 goals and 2 assists as Voodoo Grill defeats Carl's Cronies. October 2, 2016 - A 4 goal, 2 assist outing for Brett Skibba led AEN Asphalt to a 9-1 rout of Smith's Acres. Max Kneeland added to the offense with 2 goals and an assist and Greg Felber tossed in a goal and 2 assists in the win. 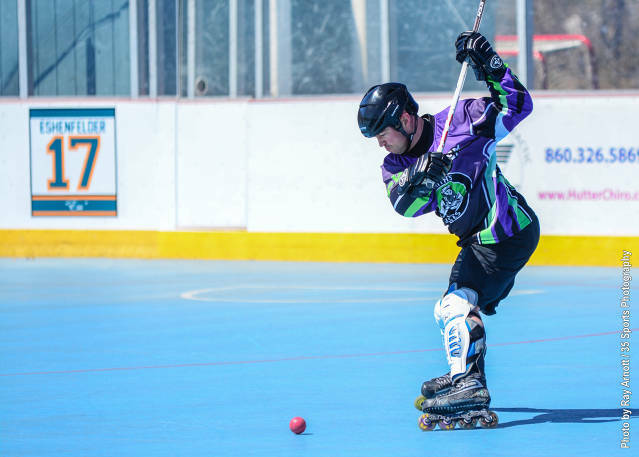 Other Week 3 highlights include Tim Logan tallying 4 goals and an assist as Navy Silent Snipers downed Lost Souls, Joe Pietrzack scoring 2 goals in Carl's Cronies' win over Nowakowski Painting and Jimmy Cerino with 6 goals and 2 assists as Voodoo Grill prevailed over Sound Home Builders. The Hayes Services vs. Electric Boat Athletic Club matchup was rained out and will be made up later in the season. 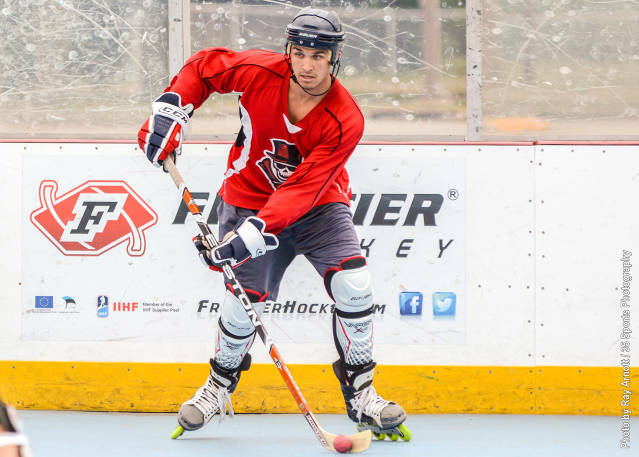 September 18, 2016 - A 2 goal, 5 assist outing from team captain Joe Forte led Smith's Acres to a 9-8 victory over Sound Home Builders. Smith's Acres was able to counter hat tricks from SHB's Tyler Haling and Mike Hall with Colby Castro's 2 goals and 2 assists, and Matt Rei's 2 goals, 1 assist. Other Week 2 highlights include Rich Barth with 2 goals for Nowakowski Painting in their win over Navy Silent Snipers, Justin Maryeski with 7 goals and 3 assists as Voodoo Grill rolls over Electric Boat Athletic Club, Chris Simpkins' 2 goal outing for Carl's Cronies as they win over Lost Souls, and Max Kneeland leading AEN Asphalt with 5 goals and an assist as they defeat Hayes Services. August 28, 2016 - Dean Patty started off the Fall 2016 Sunday Ball League season right for Lost Souls, scoring two goals and an assist against his former team, Voodoo Grill, in a 6-5 victory. Joseph Siragusa provided a goal and an assist while Luis Henriques, David Loomis and Ed Klarmann each had a goal in the win. Other Week 1 highlights include AJ Ray (3G, 3A), Mike Hall (4G, 2A) and Tyler Haling (4G, 2A) leading Sound Home Builders over Nowakowski Painting, Dustin Maurice with a hat trick in Hayes Services' win over Navy, Brett Skibba tallying 4 goals and 3 assists as AEN Asphalt rolled over Electric Boat Athletic Club, and Colby Castro lighting the lamp 6 times as Smith's Acres downed Carl's Cronies. 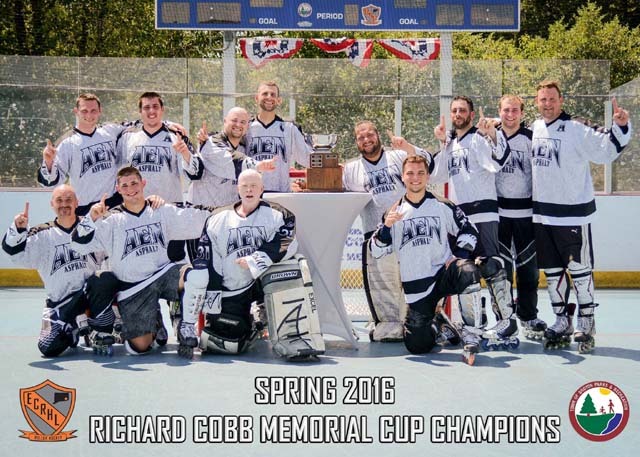 August 4, 2016 - Congratulations to AEN Asphalt, who captured their 3rd Richard Cobb Memorial Cup by defeating defending champions Sound Home Builders in the Spring 2016 ECRHL Sunday Ball League Championship Game! July 10, 2016 - Garrett Boehm (4G, 2A) provided a six point game for Smith's Acres as they defeated Voodoo Grill. Joe Forte provided a goal and 4 assists while Griff Chamberlain (1G, 2A) and Matt Rei (2G, 1A) contributed with 3 point outings. Other Week 10 highlights include AJ Ray with 6 goals and 2 assists in Sound Home Builders rout of Navy Silent Snipers, Max Kneeland with 2 goals and an assist as AEN Asphalt defeats Carl's Cronies, Chris Discordia with 3 goals and 1 assist as Hayes Services downs Nowakowski Painting, and Shaun Schaeffer with 3 goals and 3 assists as Electric Boat Athletic Club wins over Lost Souls. July 9, 2016 - Aaron Stelik was all smiles as he tallied 4 goals and 2 assists in Hayes Services' win over Carl's Cronies. Chris Discordia picked up 3 goals and 2 assists and Bill Yuhas contributed 3 goals and an assist. 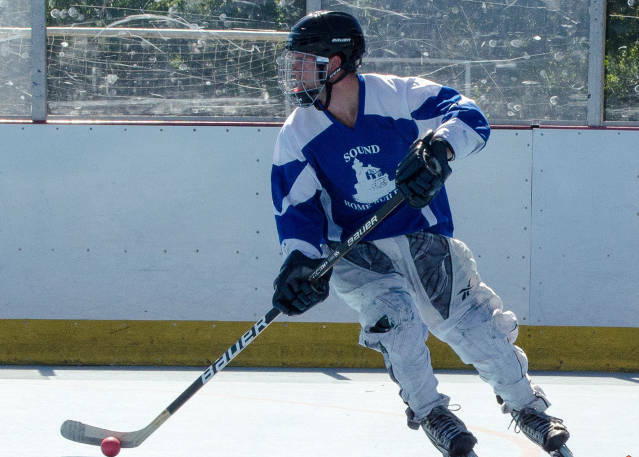 Other Week 9 highlights included Colby Castro with 7 goals and an assist as Smith's Acres routed Nowakowski Painting, Seth Cohen giving a 2 goal, 2 assist effort for AEN Asphalt in their victory over Lost Souls, and Tony Cerino's 5 goal, 1 assist outing for Voodoo Grill as they were victorious over Navy Silent Snipers. June 26, 2016 - Electric Boat Athletic Club's Jeff Estrella picked up a hat trick in his team's 9-2 win over Nowakowski Painting. Shaun Schaeffer (3G), Jim Calverase (2G, 1A) and Erik Faxon (1G, 2A) also contributed with 3 point efforts. Other Week 8 highlights include Brett Skibba providing a hat trick for AEN Asphalt as they defeat Smith's Acres, James Baker picking up 4 goals and 3 assists in Sound Home Builders win over Carl's Cronies, Smith's Acres' Colby Castro unloading for 6 goals and an assist in his team's rout of Navy Silent Snipers, Max Kneeland picking up a hat trick as AEN Asphalt edges Voodoo Grill in overtime, and Chris Discordia's 2 goals and 3 assists in Hayes Services defeat of Lost Souls. 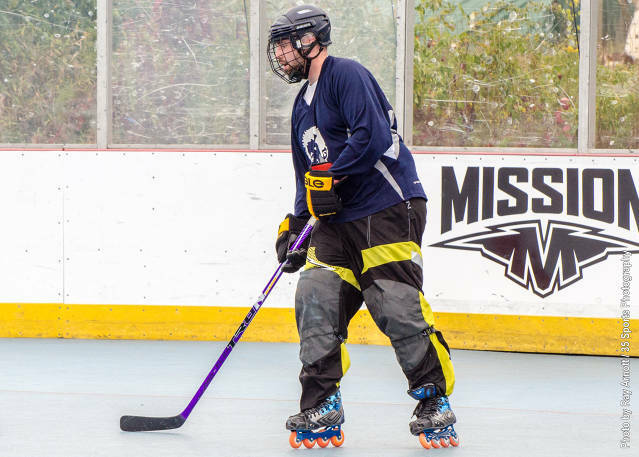 June 19, 2016 - Joe Haskins tallied 5 goals for Carl's Cronies, who downed Navy Silent Snipers 6-2. Andrew Peck added a goal and Nate Catania picked up an assist. Navy netminder Kyle Davis made 31 saves in the losing effort. Other Week 7 highlights include Tyler Haling's hat trick as Sound Home Builders hex Voodoo Grill, Mike Balamucki providing 2 goals and an assist as Lost Souls tops Nowakowski Painting in overtime, James Baker's 2 goals for Sound Home Builders in their win over AEN Asphalt, Brian Discordia providing 2 goals and 3 assists for Hayes Services as they defeat Voodoo Grill, and Garrett Boehm with the hat trick as Smith's Acres blanks Electric Boat Athletic Club. June 12, 2016 - Garrett Boehm talled 3 goals and 1 assist as Smith's Acres prevailed over Hayes Services. Colby Castro tallied a "Colby Castro Hat Trick" with 2 goals and 2 penalty minutes, and Nick Augusto chipped in with a goal and assist. Other Week 6 highlights include Chris Drakos with 6 goals and an assist in Sound Home Builders rout of Lost Souls, Max Kneeland with 6 goals and 2 assists for AEN Asphalt in their win over Navy Silent Snipers, Blake Biancamano's 4 goals and 2 assists in Voodoo Grill's victory over Nowakowski Painting, Jim Calverase scoring 3 goals and 1 assist as Electric Boat defeats Carl's Cronies, and Joe Haskins with 2 goals and 2 assists as Carl's Cronies defeats Nowakowski Painting. May 15, 2016 - Tyler Haling led Sound Home Builders on a 11-1 rout of Hayes Services with 4 goals and 1 assist. AJ Ray contributed to the offensive explosion with 2 goals and 4 assists while Mike Hall tallied a hat trick and an assist. Other Week 5 highlights include Nick Cusack scoring 2 goals as Navy Silent Snipers defeats Lost Souls, Max Kneeland's 6 goals, 2 assists as AEN Asphalt routs Nowakowski Painting, Adam Duczynski scores 4 goals for Smith's Acres as they down Lost Souls, Shaun Schaeffer picks up a hat trick and an assist in Electric Boat Athletic Club's sinking of Navy Silent Snipers, and Voodoo Grill's Todd Poquette collects 2 goals and 2 assists in his team's win over Carl's Cronies. May 1, 2016 - Brian Discordia picked up a hat trick, leading Hayes Services to victory over Electric Boat Athletic Club. Bill Yuhas also contributed to the offense with 2 goals and an assist, and Chris Discordia provided a goal and assist. All other matchups for May 1st were postponed due to rain and will be made up later in the season. April 24, 2016 - Chris Giacomazzo picks up 3 goals and 1 assist as Smith's Acres downs Sound Home Builders. Joe Forte contributed with a goal and 2 assists and Eric Sieczkowski added a goal and an assist in the win. 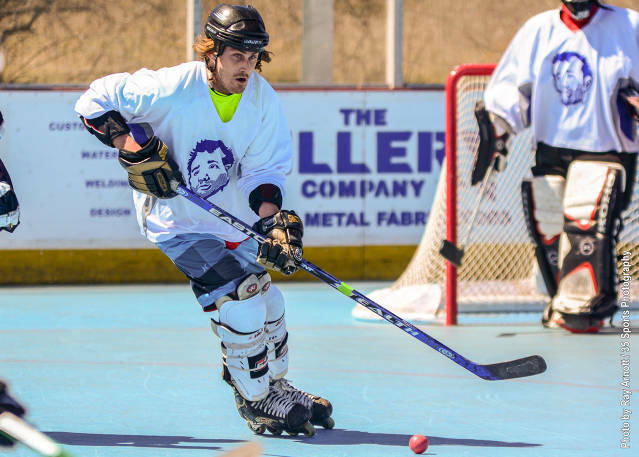 Other Week 3 highlights include Nowakowski Painting goaltender Craig Stedman making 22 saves in a win over Navy Silent Snipers, Voodoo Grill's Justin Maryeski tallying 5 goals and an assist in victory over EBAC, Kurt Knuijt scoring 4 goals in Carl's Cronies win over Lost Souls, and Max Kneeland leading AEN Asphalt with 3 goals and 2 assists over Hayes Services. 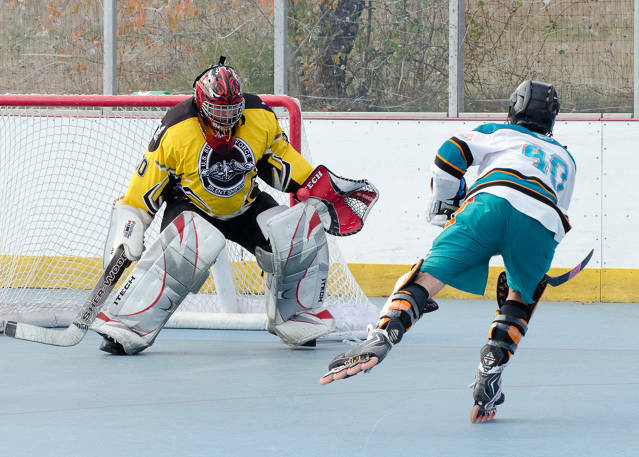 April 17, 2016 - Turning in a solid 20 save performance, Richard Pacifico and the Lost Souls put up their very first ECRHL Sunday Ball League victory with a win over Nowakowski Painting. Ben Thompson tallied 2 goals and 2 assists and Joseph Siragusa provided 2 goals and 1 assist as the Lost Souls ended a 31 game losing streak. Other Week 2 highlights include Nico Zarrillo's 26 save shutout of Sound Home Builders, Chris Discordia's double hat trick as Hayes Services doubles up Voodoo Grill, Joe Haskins scores 5 goals in Carl's Cronies rout of Navy Silent Snipers, and Colby Castro's 2 goals as Smith's Acres edges Electric Boat Athletic Club. 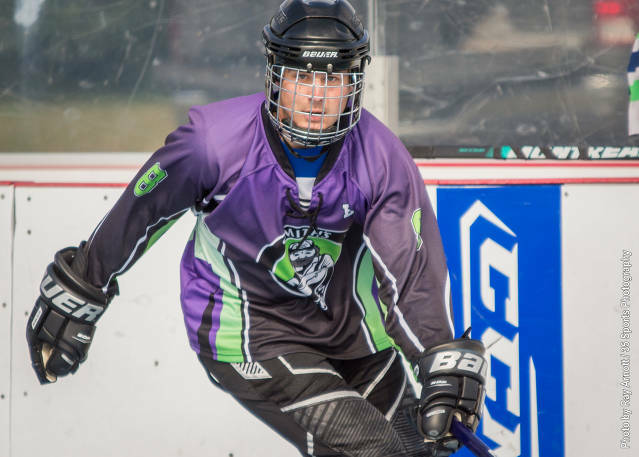 April 10, 2016 - Justin Maryeski tallied 5 goals, 2 assists in his return to Voodoo Grill, who defeated Lost Souls 13-4. Additional Voodoo Grill offense was provided by Jimmy Cerino's hat trick and Pete Argiros' 5 point outing. 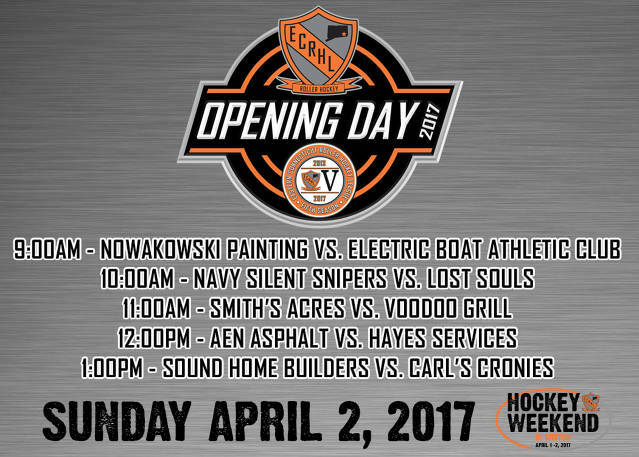 Other Week 1 highlights included Max Kneeland's 5 goals in AEN Asphalt's win over Electric Boat Athletic Club, Smith's Acres' Adam Duczynski's hat trick in his ECRHL debut, Shawn Prevost's 2 goals and assist as Hayes Services downs Navy Silent Snipers and Mike Hall's 5 goal effort as Sound Home Builders prevail over Nowakowski Painting. 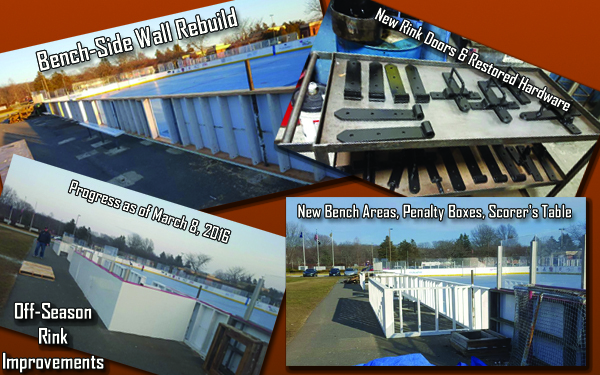 April 12, 2016 - On Saturday April 9th, finishing touches were made to the ECRHL Rink, completing a near 6-month renovation project that included a total rebuild of the bench-side rink wall, penalty boxes, scorer's tables, and rink doors. Poly board facing, installation of glass behind the benches and penalty boxes, and more spacious bench areas are the most notable changes made during the renovation. 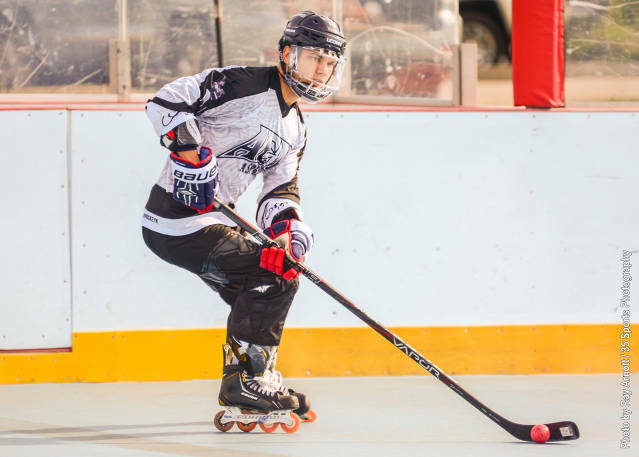 Countless hours were spent by league volunteers to make this project a success, it all paid off when Voodoo Grill faced off against Lost Souls in the first official ECRHL game since the conclusion of the renovation. 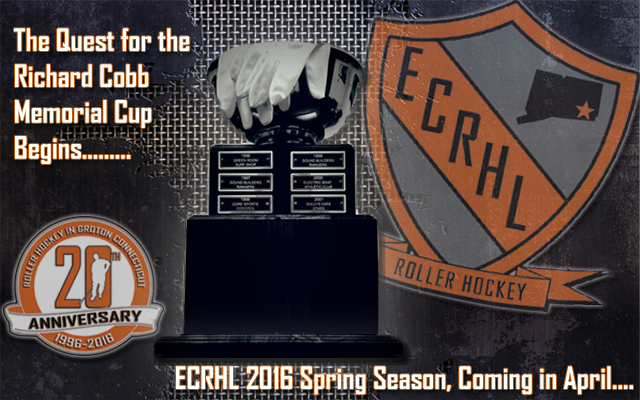 March 28, 2016 - The 2016 ECRHL season, tentatively scheduled for April 3rd, will not start on time. Rink renovations are in the finishing stages, but have not been completed. 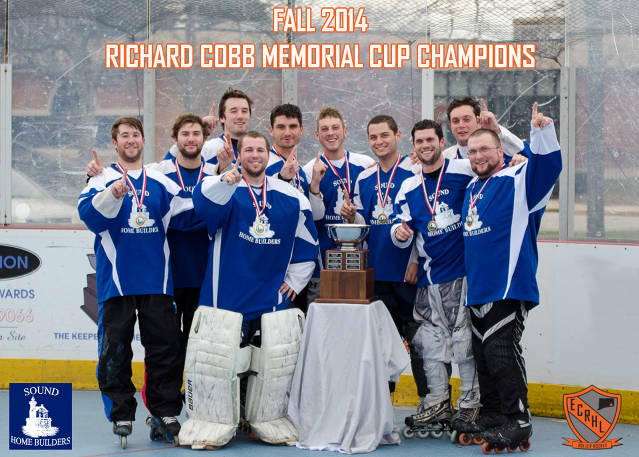 The Spring season is expected to start at some point in April, where Sound Home Builders will look to defend their 2015 Fall championship, while 9 other teams will look to dethrone them and capture the Richard Cobb Memorial Cup! March 3, 2016 - A major rink improvement/rebuild project has been taking place over the course of the fall/winter. 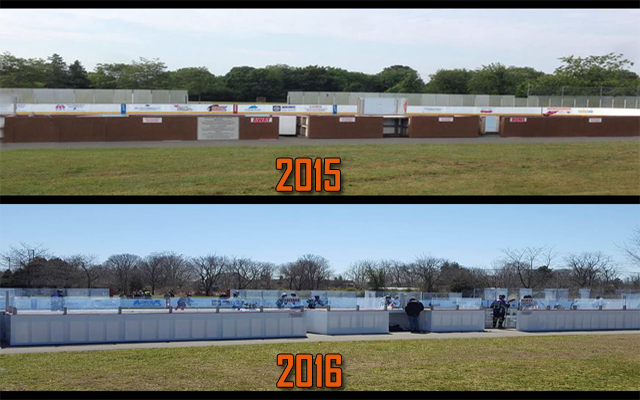 The bench side rink wall, home/visitor benches, penalty boxes, and scorer's tables were demolished to make way for a stronger rink wall, more spacious bench areas, newly constructed penalty boxes with new benches, and a revamped/more functional scorer's area. The tireless efforts of league volunteers during the rough New England winter, has this project moving along nicely! *UPDATE* Work continues, the rink wall poly sheeting is starting to be put back up. Poly sheets & red top-cap installation has begun on the benches, penalty boxes, and scorers table. Metal partitions have begun to go up which will hold the new plexi-glass around the bench areas. December 6, 2015 - Sound Home Builders win the Fall 2015 Sunday Ball League championship. 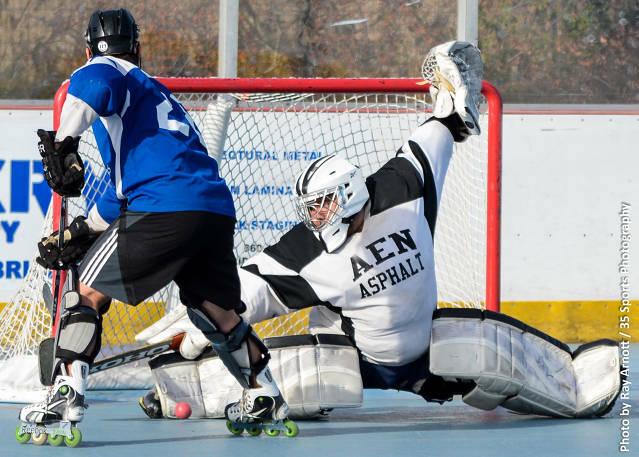 November 15, 2015 - AEN Asphalt goaltender Nico Zarrillo stretched himself to the limit, making 35 saves as AEN Asphalt defeated Sound Home Builders in what could be a preview of the Richard Cobb Memorial Cup finals. Greg Felber led the offensive attack with 2 goals. Other highlights include Karl Herman contributing 4 goals and 2 assists as Voodoo Grill cruised over Carl's Cronies, Shawn Prevost with a goal and 3 assists as Hayes Services shutout Lost Souls, Eric Sieczkowski tallying 2 goals as Smith's Acres downed Navy Silent Snipers, and Eric Johnson's 2 goals and 3 assists as Electric Boat Athletic Club routs Nowakowski Painting. November 8, 2015 - Electric Boat Athletic Club's Eric Johnson provided his club with 2 goals and 1 assist in their overtime victory over Voodoo Grill. Captain Nate Gedney provided the OT game winner, while Erik Faxon and Rikky Bustin each tallied a goal and an assist. Other Week 9 highlights include Chris Discordia's 4 goal, 1 assist outpouring as Hayes Services defeated Carl's Cronies, Cody Allard's 4 goal, 3 assist effort as Sound Home Builders rolled over Nowakowski Painting, Nick Augusto with 2 goals and 3 assists as Smith's Acres wins over Lost Souls, and Max Kneeland with the double hat trick plus 3 assists as AEN Asphalt rolls over Navy Silent Snipers. November 7, 2015 - Smith's Acres' Nick Augusto led his squad with a hat trick as they shut out Electric Boat Athletic Club. 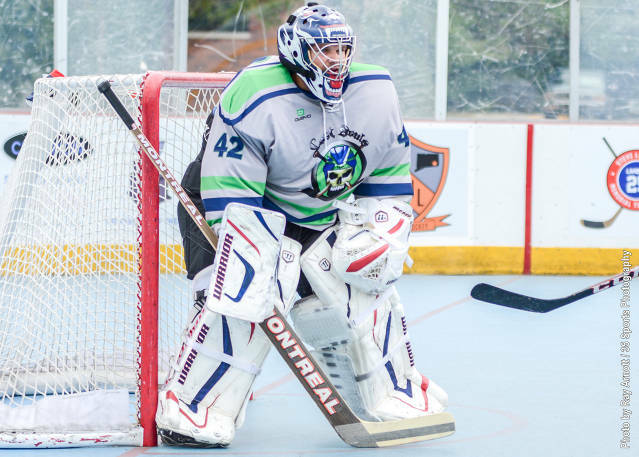 After making 5 saves, substitute goaltender Max Kneeland was forced to leave the game due to injury and was relieved by Robert Cacchiola, who appeared in all 5 Sunday games. Other Week 8 highlights include John Orefice providing the game winner and a 2 goal effort as Voodoo Grill edged Nowakowski Painting, Chris Simpkins' 2 goal, 1 assist day as Carl's Cronies sank Navy Silent Snipers, Max Kneeland's 7 goal, 4 assist outpouring as AEN Asphalt routed Lost Souls, and Chris Drakos with 2 goals and 3 assists as Sound Home Builders downed Hayes Services. 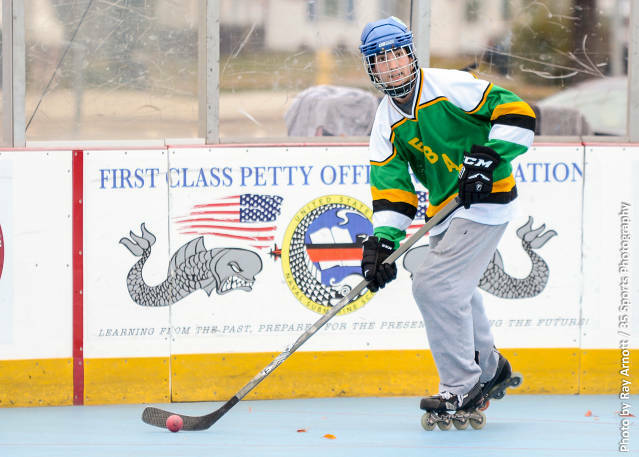 November 1, 2015 - Joe Forte (3G, 4A) racked up 7 points as his Smith's Acres club routed Carl's Cronies. Fellow Smith's Acres teammate Chris Giacomazzo picked up a hat trick of his own and Nick Augusto (2G, 3A) contributed with a 5 point outing. 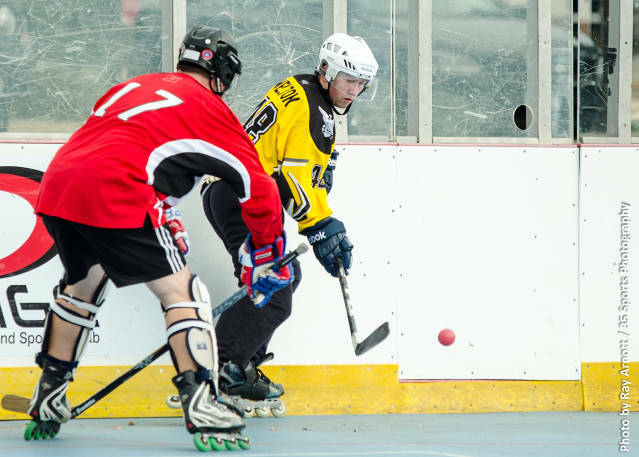 Other Week 7 highlights include Anthony Cubbage providing 3 goals and an assist as Navy Silent Snipers downed Lost Souls, James Baker's 2 goals and 3 assists as Sound Home Builders edged Voodoo Grill, and Max Kneeland with 5 goals and an assist as AEN Asphalt defeated Nowakowski Painting. October 18, 2015 - James Baker's 2 goal, 1 assist effort led Sound Home Builders in a dominant win over Smith's Acres. Chris Drakos' unselfish play provided him with 1 goal and 4 assists on the day, feeding Cody Allard for his 2 goals. Other Week 6 highlights include Erik Faxon's hat trick as Electric Boat Athletic Club shuts out Navy Silent Snipers, Max Kneeland with 5 goals and one assist in AEN Asphalt's rout of Voodoo Grill, Tim Malzhan's hat trick for Nowakowski Painting as they draw even with Hayes Services, and Nate Catania and Josh Chouinard's hat tricks for Carl's Cronies as they roll over Lost Souls. October 11, 2015 - Karl Herman provided Voodoo Grill with the overtime heroics, tallying the game winner over Hayes Services. After both clubs tallied goals late in the first, the game remained scoreless entering the extra frame. Substitute goaltender Craig Richard provided 2 key OT saves in his 28 save performance. Other Week 5 highlights include Max Kneeland with 5 goals and 1 assist as AEN Asphalt rolls over Carl's Cronies, Shaun Schaeffer's 3 goals and 4 assists as Electric Boat Athletic Club blanks Lost Souls, AJ Ray picking up 3 goals and 2 assists as Sound Home Builders defeat Navy Silent Snipers, and Nick Augusto and Colby each with 2 goals and an assist as Smith's Acres hands a loss to Nowakowski Painting. October 4, 2015 - Defensman Chris Turner showed his offensive side, tallying 2 goals in AEN Asphalt's victory over Hayes Services. Fellow teammate Max Kneeland provided 2 goals and an assist, and goaltender Nico Zarrillo turned in a 15 save effort. Other Week 4 highlights include Electric Boat Athletic Club's Erik Faxon with 4 goals, 4 assists in a rout of Carl's Cronies, Dan Morrisey's 1 goal, 2 assists as Nowankowski Painting defeats Navy Silent Snipers, Smith's Acres' Craig Richard's 15 save shutout of Voodoo Grill and Mike Hall tallies 8 goals, 1 assist as Sound Home Builders rout Lost Souls. 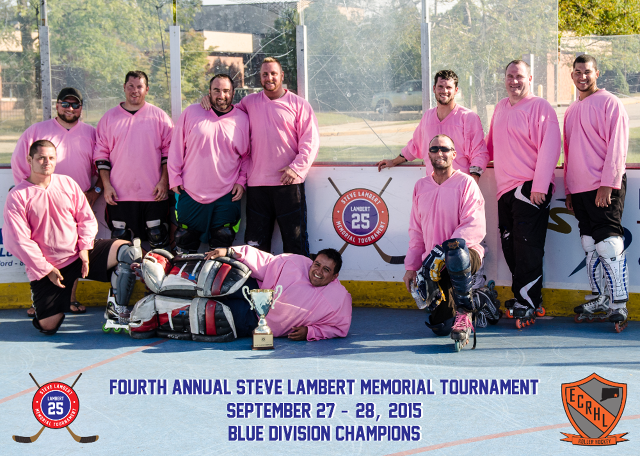 September 28, 2015 - Straight Outta Groton took home the Blue Division championship at the Fourth Annual Steve Lambert Memorial Tournament, defeating South County in the finals 4-2. Congratulations to team members Scott Webster, Dean Patty, Tom Bongo, Sloan Arnold, James Baker, Dave Baskin, Cody Allard, AJ Ray, Richard Lopez and Justin Maryeski. 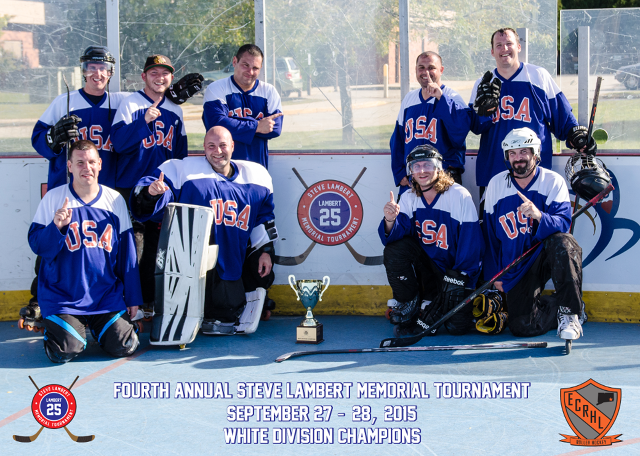 September 28, 2015 - Team USA captured the White Division championship at the Fourth Annual Steve Lambert Memorial Tournament, defeating last year's champion Drunken Pirates in the finals by a score of 1-0. Congratulations to team members Vinny Bianco, Alek Kanevsky, Scott Brown, Matthew Clark, Bill St. Pierre, Eddie Cain, Eric Higgins, Michael Barry, and Timmy Logue. 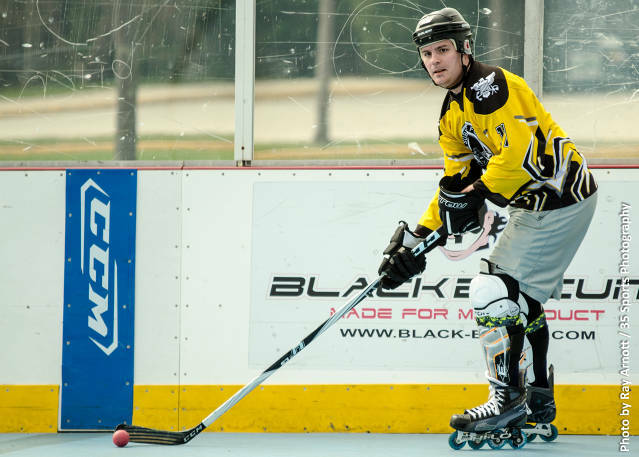 September 20, 2015 - Navy Silent Snipers' Randy Welton tallied 2 goals, including the game winner in overtime over Voodoo Grill. Teammate Jeff Rizzo picked up a goal and assist while netminder Rob Cacchiola turned away 16 Voodoo attempts. Other Week 3 highlights include Tim Maizhan's hat trick as Nowakowski Painting defeats Lost Souls, Cody Allard turning in 5 goals and 3 assists in Sound Home Builders rout of Carl's Cronies, Max Kneeland with 4 goals and an assist in AEN Asphalt's victory over Electric Boat Athletic Club, and Griffin Chamberlain's 1 goal, 2 assist outing as Smith's Acres draws even with Hayes Services. 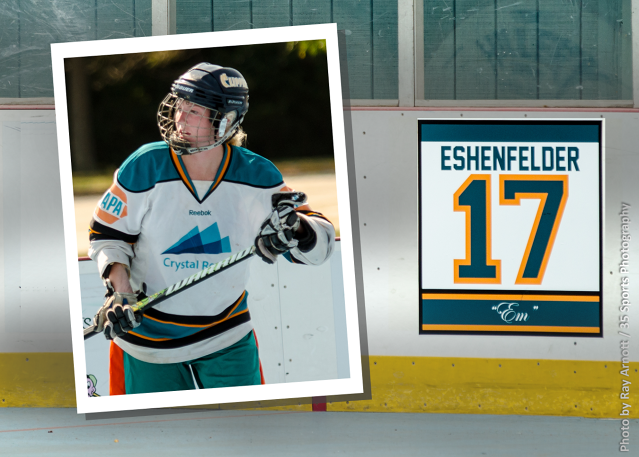 September 13, 2015 - Prior to the first game of the day, the Eastern Connecticut Roller Hockey League family paid tribute to Smith's Acres forward Emily Eshenfelder, who passed unexpectedly on September 4th. With family, friends, and fellow league members donning "Emily Strong" shirts looking on, her teammates unveiled a tribute banner placed on the dasher boards in her memory during an emotional pre-game ceremony as Smith's Acres prepared to face AEN Asphalt. 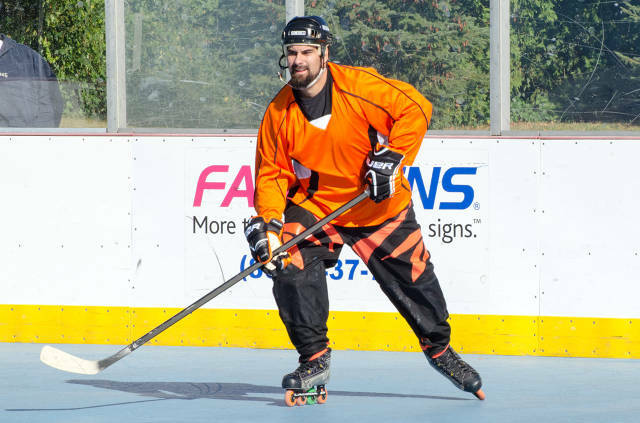 August 30, 2015 - Chris Drakos opened up the Fall 2015 Sunday Ball League season with a hat trick, leading his team over defending champion AEN Asphalt. 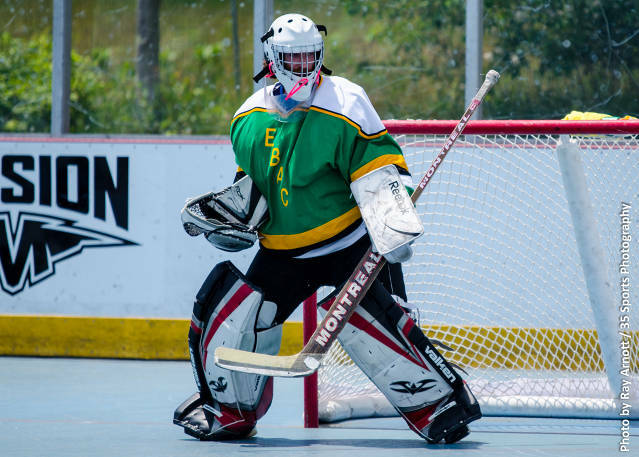 Teammate Cody Allard made his ECRHL debut and picked up a goal and 2 assists, while netminder Richard Lopez, also making his first ECRHL appearance, stopped 11 saves in the win. Other Week 1 highlights include Matt McLoughlin with 5 goals and 1 assist in Smith's Acres win over Navy Silent Snipers, Keith MacWilliam's hat trick as Electric Boat Athletic Club downs Nowakowski Painting, Dustin Maurice scoring 3 goals as Hayes Services rolls over Lost Souls and Chris Discordia's 3 goals, 2 assists as a substitute for Voodoo as they win over Carl's Cronies. 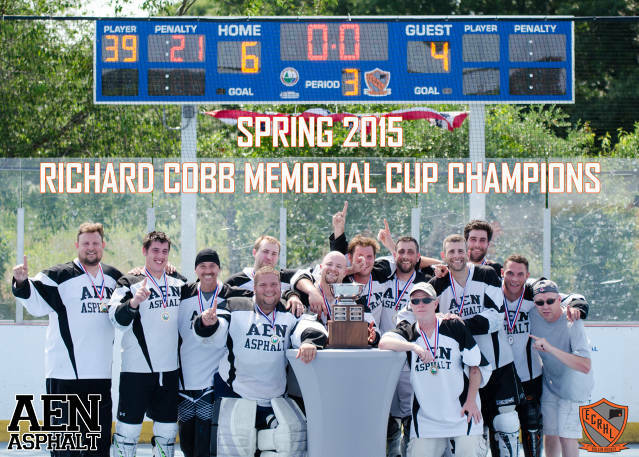 July 12, 2015 - AEN Asphalt captured their second Richard Cobb Memorial Cup with two hard earned playoff wins. 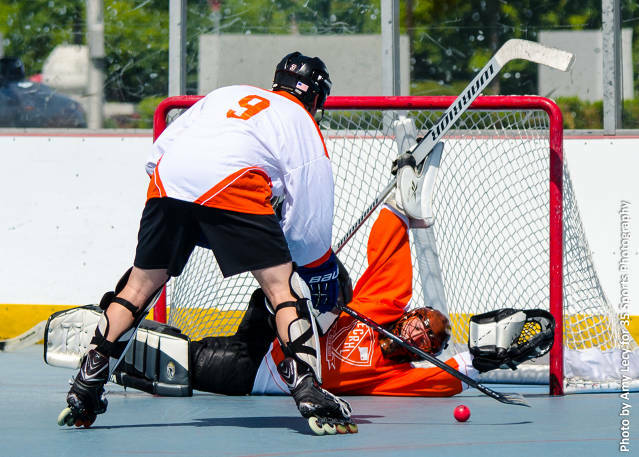 In their semifinal matchup with Voodoo Grill, AEN found themselves down two goals entering the third period. Greg Felber, who had 2 goals early in match, tacked on another 2, along with a goal each from Max Kneeland and Seth Cohen, giving AEN the edge late in the third. With 1:46 remaining in regulation, Voodoo's Jimmy Cerino completed his hat trick, bringing his club within one, then with a minute left, Dean Patty tacked on the equalizer, forcing the game to overtime. 4:40 into the extra frame, Chris Turner found Felber for the game winner, Turner's 4th assist and Felber's 5th goal of the game. 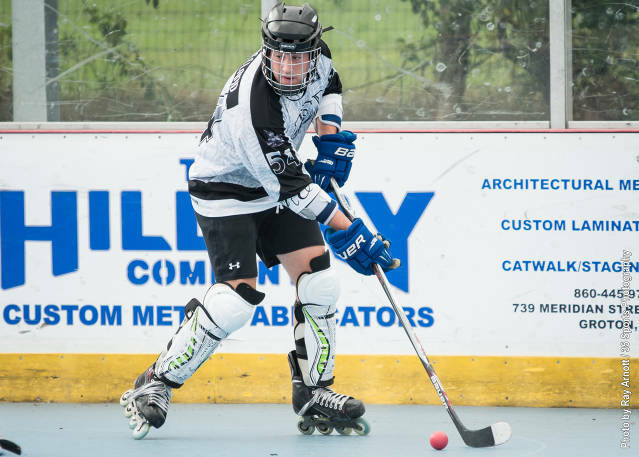 In the finals, AEN Asphalt faced Crystal Rock, who had earned their way with dominant wins over Carl's Cronies in the quarterfinals and Sound Home Builders in the semifinals. With Crystal Rock leading 3-2 on 2 goals from Garrett Boehm and a goal from Matt Rei, and with 9:05 remaining in the contest, Austin Samson tallied his second, followed a minute and seven seconds later by a goal from Tommy Eshenfelder, giving AEN the lead for good. Max Kneeland would tack on an empty net goal late, sealing the championship. June 28, 2015 - Seamus Moran's 3 goals and an assist led the way as AEN Asphalt closed out the regular season with a 6-2 win over Crystal Rock. Netminder Nico Zarrillo turned in another strong performance, stopping 31 of 33 Crystal Rock attempts. Crystal Rock's Nick Augusto contributed his team's two goals in the losing effort. 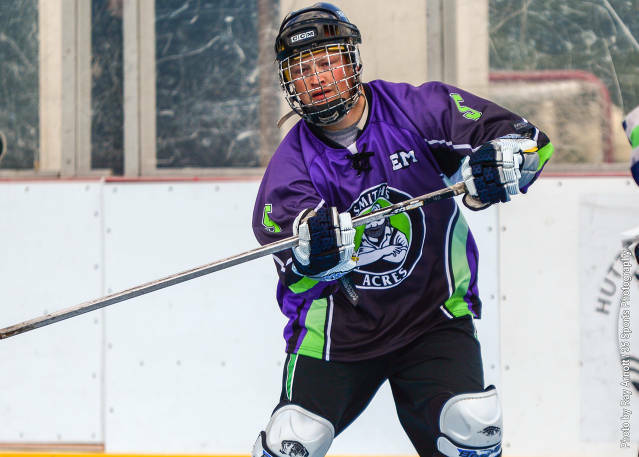 Other highlights include Justin Maryeski's 2 goals as Navy Silent Snipers down a shorthanded Sound Home Builders, and John Orefice contributes 2 goals and 2 assists as Voodoo Grill edges Hayes Services in overtime. 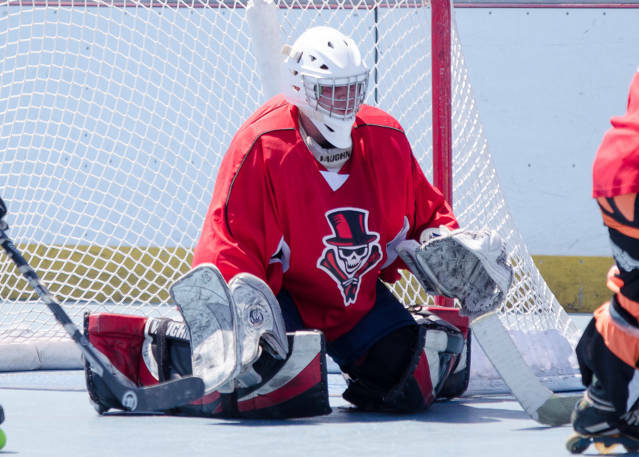 June 14, 2015 - Chris Serano put on a brilliant display of goaltending, stopping 34 of 36 shots in Electric Boat Athletic Club's win over Voodoo Grill. Matt Singer and Rikky Bustin each tallied 2 goals and an assist. Jimmy Cerino picked up 2 assists for Voodoo Grill in the loss. Other Week 9 highlights included Seth Cohen's 4 goals and 2 assists in AEN Asphalt's shutout rout of Navy Silent Snipers, James Baker's 4 goal, 5 assist outpouring as Sound Home Builders downed River Rats, Chris Simpkins with the game winner plus assist as Carl's Cronies edged Hayes Services, and Garrett Boehm's 3 goals, 2 assists in Crystal Rock's rout of Lost Souls. 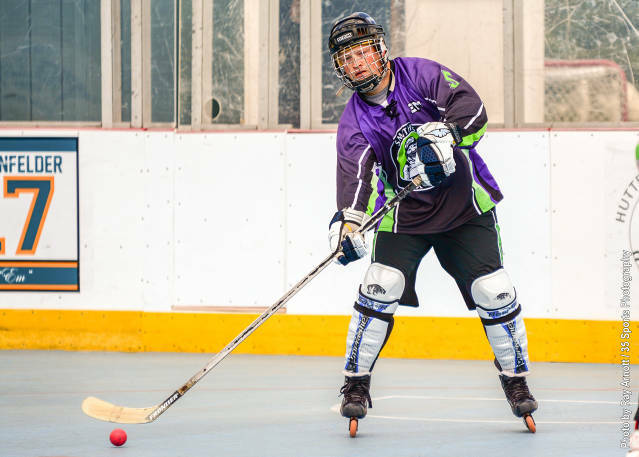 June 7, 2015 - Anthony Cubbage tallied a hat trick as Navy Silent Snipers defeated Lost Souls. Robert Cain contributed with 2 goals and 3 assists while Justin Maryeski picked up a goal and 2 assists. Lost Souls netminder Richard Pacifico faced a barrage of 43 shots, stopping 34 in the losing effort. Other Week 8 highlights included AJ Ray with 3 goals and 3 assists as Sound Home Buliders bested Voodoo Grill, Seth Cohen and Max Kneeland both collecting hat tricks as AEN Asphalt steamrolled over River Rats, Colby Castro's 2 goals and an assist as Crystal Rock blanked Carl's Cronies, and Eric Johnson's 2 goal, 2 assist effort as Electric Boat Athletic Club defeated Hayes Services. 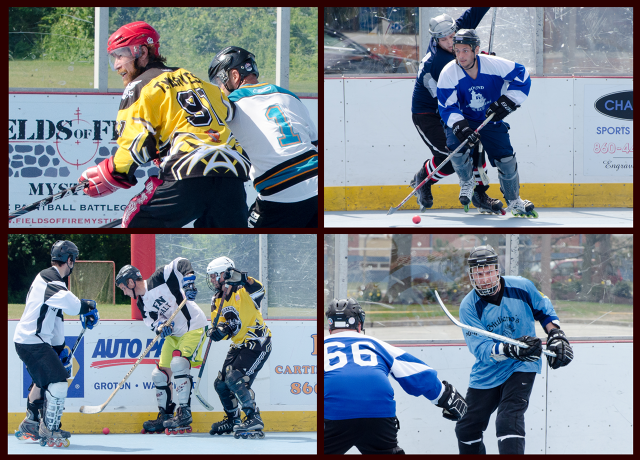 June 7, 2015 - The ECRHL hosted it's inaugural Sunday Ball League All-Star Game event. Players were selected by their peers in a secret ballot vote, where every team was represented. The event started with the skills competition. 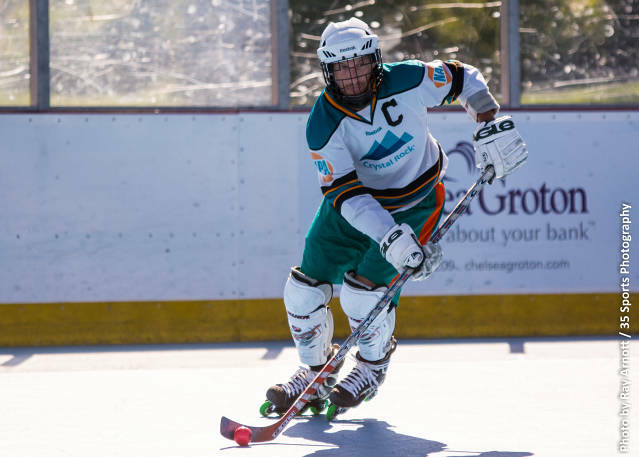 In the fastest skater event, Garrett Boehm edged the competition with a time of 18.35 seconds, beating Tim Kolnaski by 0.29 seconds and his Crystal Rock teammate Joe Forte by 0.64 seconds. The hardest shot competition was won by Sound Home Builders' James Baker with a 85MPH blast. His teammate AJ Ray finished a close second with a reading of 83MPH, and AEN's Isaac Bassham took 3rd with an 82MPH rocket. The accuracy competition proved challenging to all participants, many of which timed out before hitting all 4 targets. AJ Ray was able to get the job done with a time of 25.41 seconds, followed by Navy's Justin Maryeski with a time of 27.55 seconds. Finishing third was James Baker at 34.29 seconds. The final skills event was the Breakaway Eliminator, where Joe Drouillard and Issac Bassham of Team White shared the win. A shortened game was played following the skills competition, with Team White winning 5-2. May 31, 2015 - Jason Steele tallied 2 goals as Voodoo Grill defeated River Rats. Dean Patty continued his outstanding season with 2 assists, and Scott Steele closed the door, allowing only 1 goal on 17 shots. Other Week 7 highlights included Joe Haskins with 2 goals and 2 assists as Carl's Cronies downed Navy Silent Snipers, James Baker's 4 goals, 3 assists in Sound Home Builders' win over Hayes Services, 2 goals and 3 assists for Greg Felber in AEN Asphalt's rout of Lost Souls, and Garrett Boehm with 2 goals as Crystal Rock rolls over Electric Boat Athletic Club. 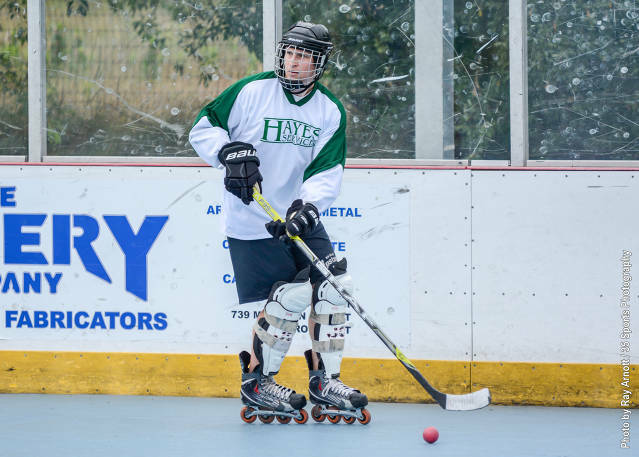 May 17, 2015 - George White provided the game winning goal and an assist as River Rats edged Hayes Services. With the River Rats trailing 2-1 entering the third period, Tom Wardell tallied the equalizer on a George White assist with just under 10 minutes to go. 2 minutes and 42 seconds later, White scored the game winner on a shorthanded bid. Craig Stedman shut the door, stopping all 11 shots he faced in the third on his way to a 25 save performance. Other highlights include Colin Morgan's 5 goal outing as Sound Home Builders downed Crystal Rock, Peter Eshenfelder's hat trick in AEN Asphalt's defeat of Voodoo Grill, Josh Chouniard's 4 goals and assist in Carl Cronies victory over Lost Souls, and Austin Samson's 4 goals and an assist as a sub for EBAC in their win over Navy Silent Snipers. 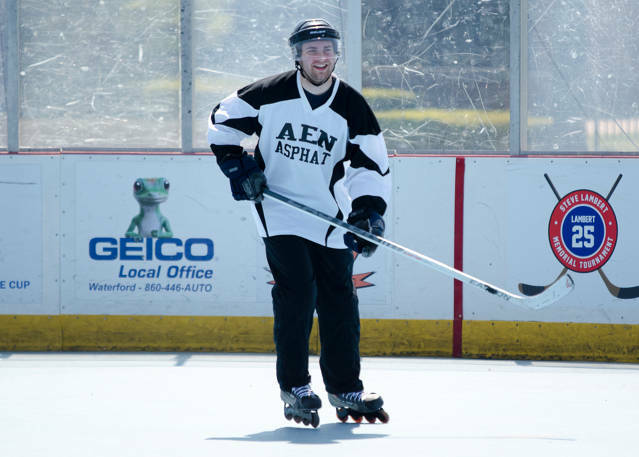 May 10, 2015 - Austin Samson tallied 3 goals and an assist in his second ECRHL game as AEN Asphalt defeated Carl's Cronies. AEN jumped out to the early 4-0 lead with Max Kneeland picking up 2 of his 3 goals in the first period, then foiled the Cronies late comeback effort with strong defense and solid goaltending from Nico Zarrillo. 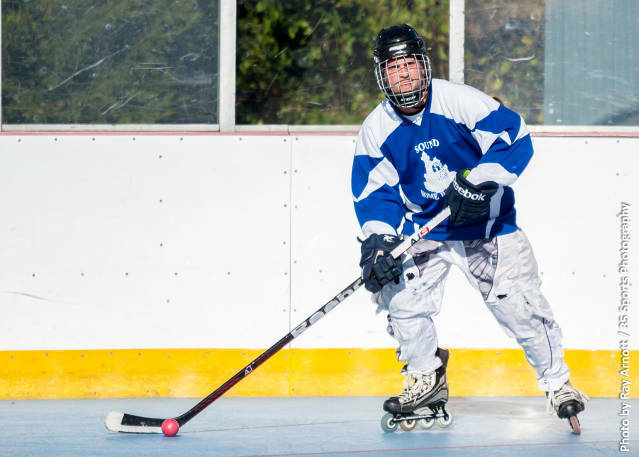 Other Week 5 highlights include Garrett Boehm's 2 goals and 3 assists as Crystal Rock wins over River Rats, AJ Ray scoring 4 goals and 3 assists in Sound Home Builders victory over Navy Silent Snipers and Eric Faxon's 3 goals and an assist as EBAC rolls over Lost Souls. May 3, 2015 - Voodoo Grill's rookie netminder Scott Steele turned in a stellar performance, making 37 saves to preserve a comeback tie against Crystal Rock. Down by 3 with less than 10 minutes to go, Blake Biancomano tallied 2 goals in just over 2 minutes to bring Voodoo within one, then Jimmy Cerino picked up the game tying goal on the powerplay with 1:20 left in regulation. In overtime, Crystal Rock had all of the scoring chances, but Steele stayed sharp, making 3 key saves. Other Week 4 highlights include Donovan Snyder's hat trick effort for Lost Souls despite their loss to Sound Home Builders, Justin Maryeski's 4 goals and an assist as Navy Silent Snipers sink River Rats, Rikky Bustin turning in a hat trick in EBAC's win over Carl's Cronies, and Max Kneeland's 4 goals, 2 assists as AEN Asphalt routs Hayes Services. 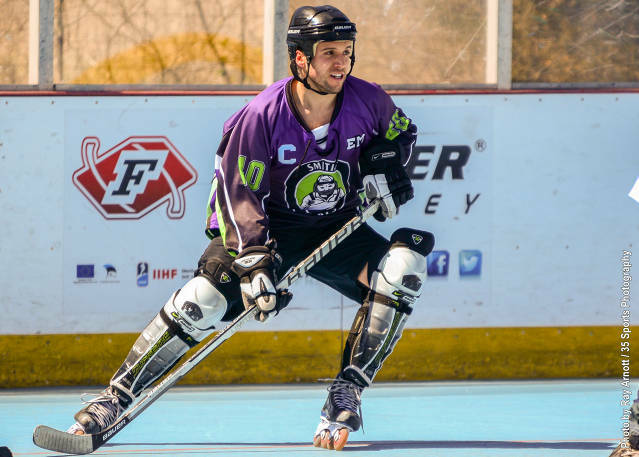 April 26, 2015 - After a strong defensive outing in Week 2, George White turned on the offense, leading River Rats with 2 goals and an assist as they prevailed over Lost Souls. The Rats spread the wealth around with 6 players picking up a goal in the win. Other Week 3 highlights included Josh Chouinard's 3 goals and an assist as Carl's Cronies downed Sound Home Builders, Max Kneeland pouring on the offense with 7 goals and an assist as AEN Asphalt routed EBAC, Chris Giacomazzo's goal and assist in Crystal Rock's blanking of Hayes Services, and Jimmy Cerino's 2 goal effort in his first ECRHL game as Voodoo Grill edged Navy Silent Snipers. 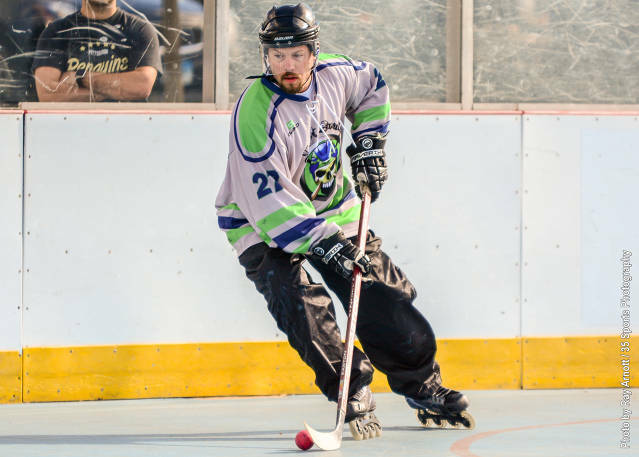 April 19, 2015 - An outstanding performance by Cliff Pinnock, who picked up 2 goals and 2 assists, helped lead the way as River Rats picked up their first win of the season with a 7-3 besting of Carl's Cronies. Sean Brawley also chipped in with 2 goals and 2 assists of his own and George White played a strong defensive game and tallied a goal and 2 assists. 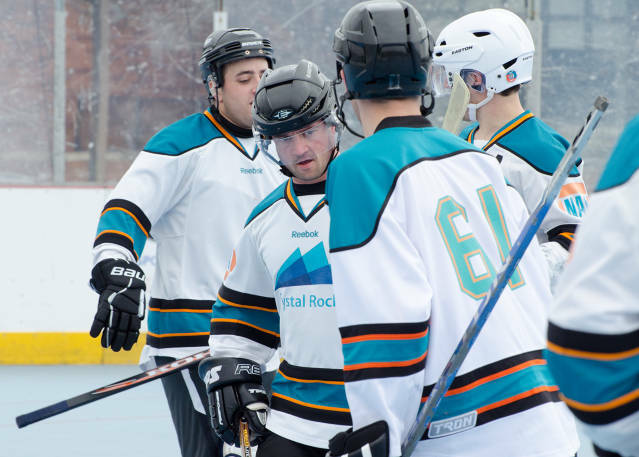 Other highlights include Seamus Moran picking up his first ECRHL goal and the game winner for AEN Asphalt over Crystal Rock, Rob Cacchiola's 24 save performance as Navy Silent Snipers edged Hayes Services, AJ Ray's 5 goal, 1 assist outing as Sound Home Builders routs a sub-filled Electric Boat Athletic Club, and Dean Patty's Voodoo Grill debut leads to a 5 goal, 1 assist performance in a win over Lost Souls. 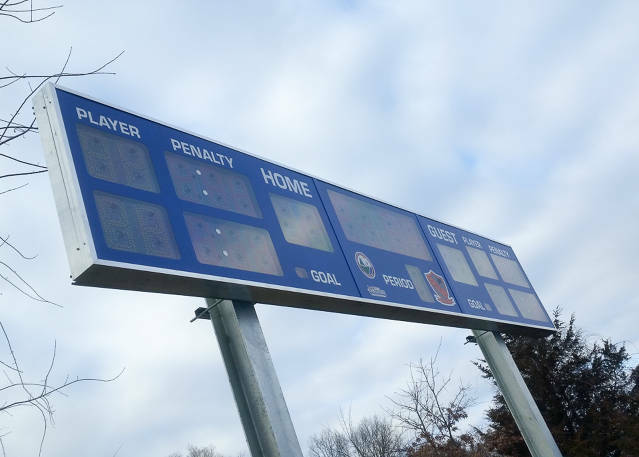 April 12, 2015 - After a delayed start caused by a harsh and relentless winter, the Spring 2015 Sunday Ball League got underway, highlighted by the debut of the brand new scoreboard purchased and installed through advertising and fundraising efforts of league volunteers. This new addition brings the league to a whole new level of professionalism and organization. Other highlights include a 30 save effort from Craig Stedman as River Rats tied Electric Boat Athletic Club, Adam Keefe with 3 goals and 2 assists as Hayes Services makes their ECRHL debut with a win, James Baker picking up the hat trick with an OT winner as Sound Home Builders edges AEN Asphalt, Blake Biancomano tallies 6 goals, 3 assists as Voodoo Grill downs Carl's Cronies, and Eric Sieczkowski and Griffin Chamberlain each score 2 goals as Crystal Rock defeats Navy Silent Snipers. 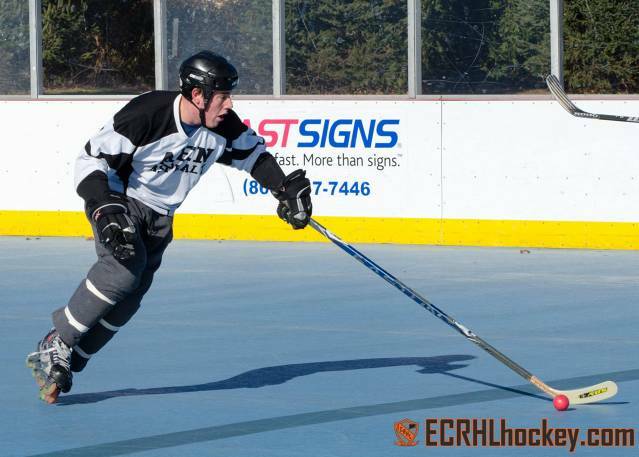 April 6, 2015 - After 2 delayed starts, the 3rd year of the ECRHL will begin on Sunday, April 12th with the opening weekend of the Spring 2015 Sunday Ball League. 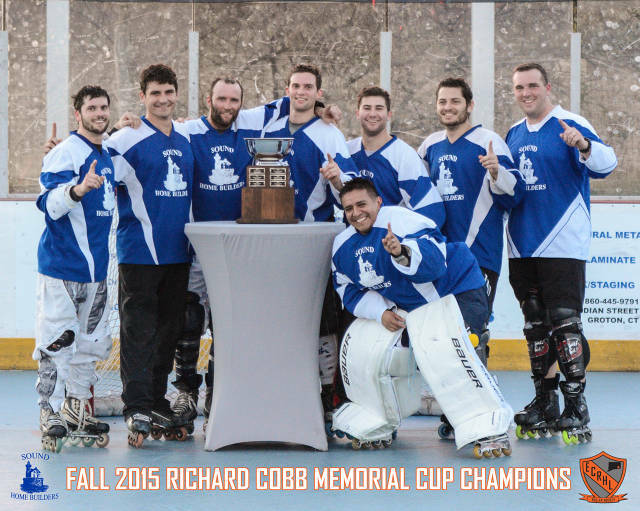 10 teams are slated to compete for the right to hoist the Richard Cobb Memorial Cup. Individual players looking for a team can use the "Contact Info" link in the left menu to have your name added to the list of available free agents. 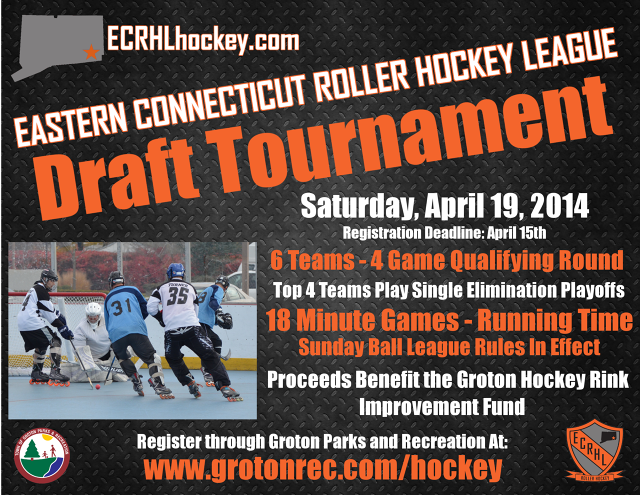 April 12, 2014 - The ECRHL will host their first draft style tournament on Saturday, April 19th. 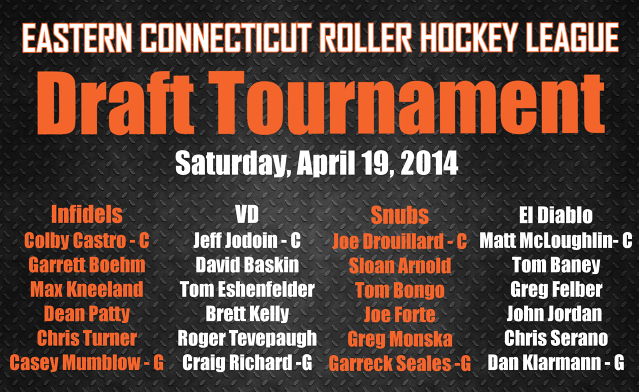 The first 36 skaters and 6 goaltenders registered will be divided out to 6 teams during the draft held on April 16th. Each team will play 4 qualifying games. The top 4 seeds will play a single-elimination playoff. Cost to register is $30/player and the registration deadline is April 15th. 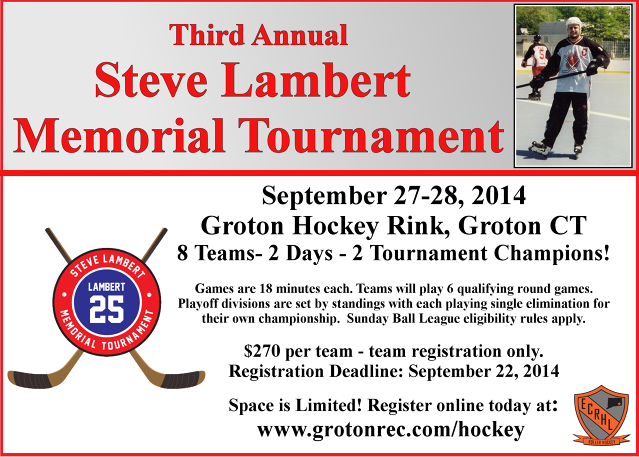 To register, go to grotonrec.com/hockey. 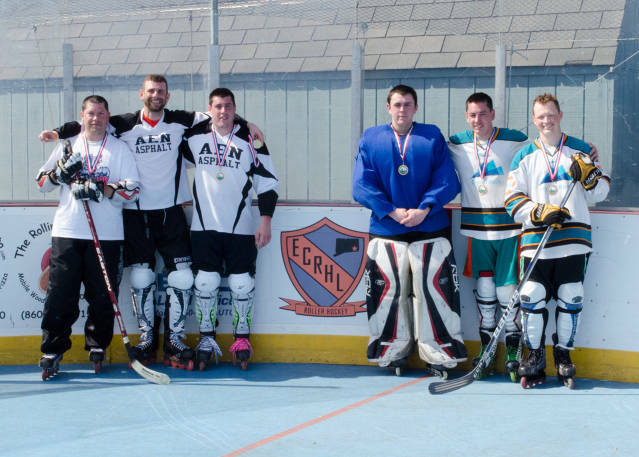 November 16, 2014 - Sound Home Builders claimed their first ECRHL Sunday Ball League Championship in impressive fashion, defeating defending Cup Champions Giuliano's Bakery. 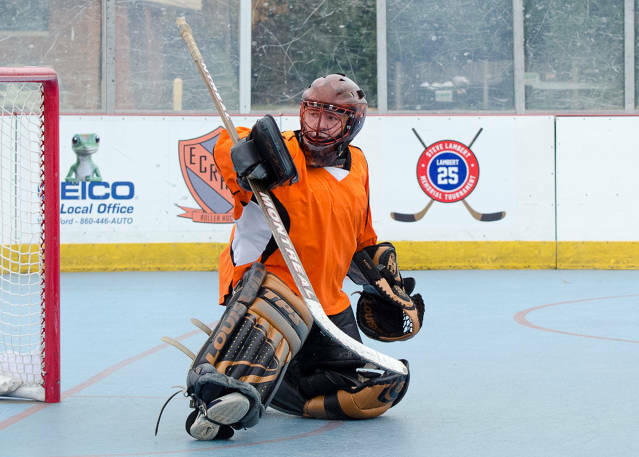 November 9, 2014 - The 10th and final week of the Fall 2014 ECRHL Sunday Ball League provided a shake up in the standings as seeds 2, 3 and 4 swapped positions. Crystal Rock started the weekend as the second seed, only to have playoff ousted Electric Boat Athletic Club play spoiler and defeat them 3-2. 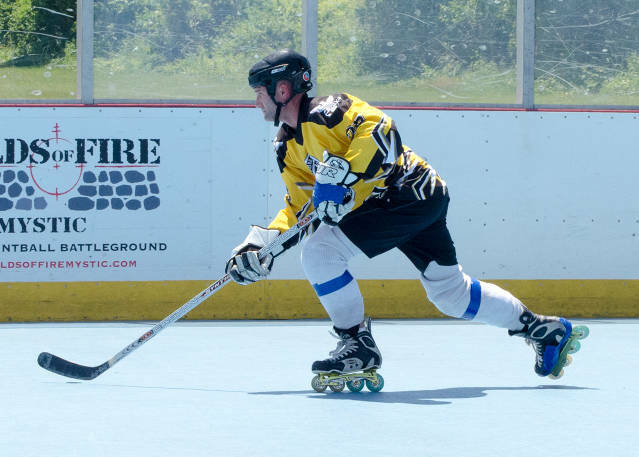 AEN Asphalt entered the day in 3rd, with a chance to move as high as 2nd, but were edged by Sound Home Builders 8-7. 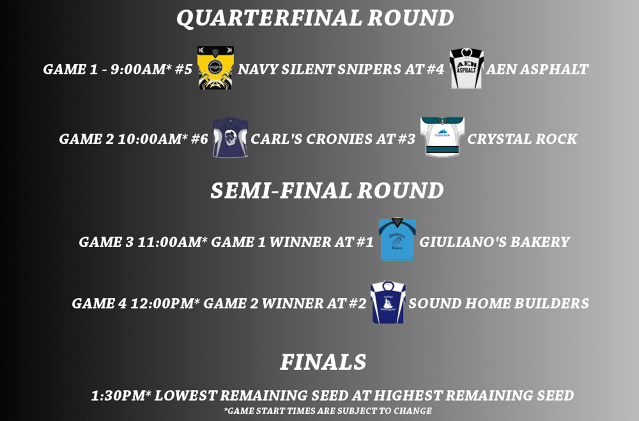 Needing 2 wins and a Giuliano's Bakery loss to move into first, Sound Home Builders picked up the two victories, including a Week 9 makeup, but Bakery locked up the top spot with a win over Navy Silent Snipers, who were locked in the 5 seed. The final playoff matchups and game times are listed above. November 9, 2014 - With Electric Boat Athletic Club needing a substitute goaltender for their final game of the season, Rob Cacchiola answered the call in a big way, stopping 28 of 30 shots, allowing EBAC to play spoiler by defeating playoff bound Crystal Rock. With the loss, Crystal Rock dropped from 2nd in the standings to 3rd, surrendering their first round bye. Other highlights include Kyle Manuilow making 30 saves in a stellar performance as Giuliano's Bakery defeated Navy Silent Snipers, Sloan Arnold scoring 5 goals as Voodoo Grill finished up their season with a win over Sabilia Law Firm, Keith Drakos tallies 4 goals as Sound Home Builders edges AEN Asphalt, Josh Chouinard picking up 4 goals and 3 assists as Carl's Cronies dispatches River Rats, and Colin Morgan with the hat trick plus assist as Sound Home Builders win over EBAC in their Week 9 makeup. 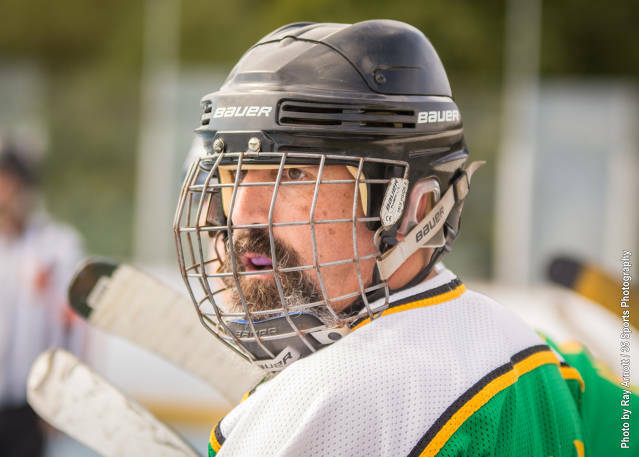 November 2, 2014 - After a rough outing in the previous week, Craig Stedman bounced back with a 33 save effort as River Rats tied the high powered offense of Crystal Rock. Trailing by one late in the third, Crystal Rock's Garrett Boehm scored the game's final goal with 1:30 remaining to force overtime. In the extra frame, Stedman continued his excellence, making 3 key saves to secure the tie. 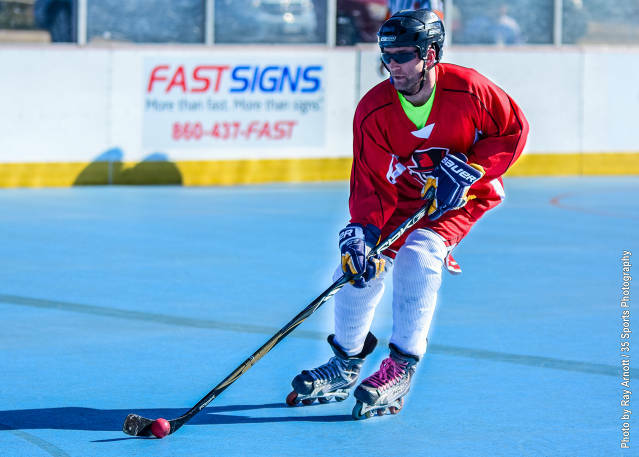 Other highlights include Peter Argiros tallying 3 goals and 2 assists as Giuliano's Bakery defeats Carl's Cronies, Robert Cain's hat trick as Navy downs Sabilia Law Firm, and Max Kneeland's 3 goal, 3 assist output as AEN Asphalt rolls over Voodoo Grill. The EBAC vs. Sound Home Builders game was postponed due to weather and has been rescheduled to November 9th at 2PM. 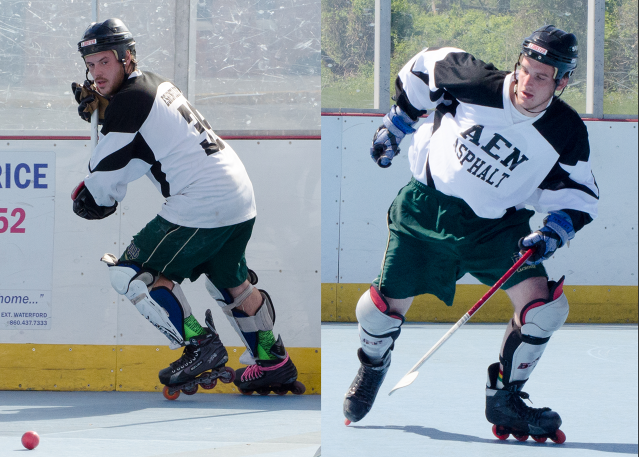 October 26, 2014 - Tom Eshenfelder (3G, 1A) and Peter Eshenfelder (2G, 2A) led they way for AEN Asphalt as they doubled up on Navy Silent Snipers. With the win, AEN moves to 6-2 and holds on to the 3rd place spot in the standings. Other highlights include AJ Ray's 9 goals and 2 assists in Sound Home Builders win over River Rats, Keith MacWilliam scoring 3 goals, 4 assists as EBAC plays spoiler and eliminates Voodoo Grill from playoff contention, Garrett Boehm's hat trick and assist as Crystal Rock defeats Carl's Cronies, and Mike Balamucki's 4 goals, 2 assists as Giuliano's Bakery downs Sabilia Law Firm. 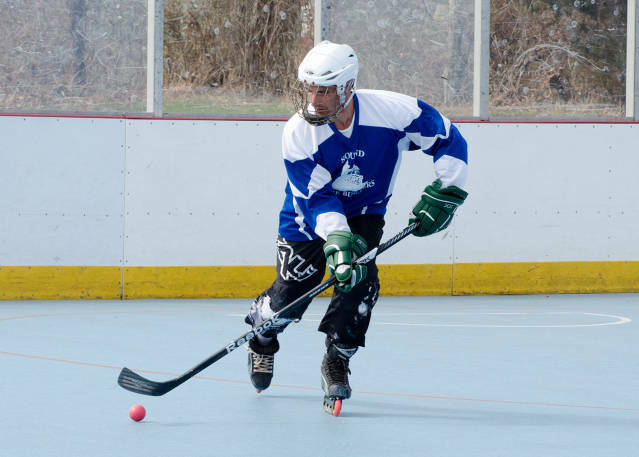 October 19, 2014 - In a battle of two teams entering the weekend at 5-1, Joe Forte led Crystal Rock to a 4-2 win over Sound Home Builders with a goal and an assist. Equally important to the win, Max Kneeland substituted in goal and stood on his head, stopping 19 of 21 shots. Other highlights include Jerry Theiler starting the day with 6 goals in Voodoo Grill's win over River Rats, then, as a substitute player, scores 3 more for Giuliano's Bakery in their win over AEN Asphalt, Joe Haskins' hat trick in Carl Cronies win over Sabilia Law Firm, and Anthony Cubbage with a goal and 2 assists as Navy defeats EBAC. 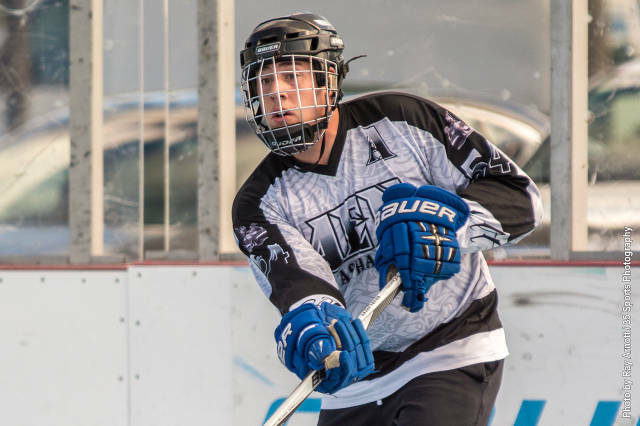 October 12, 2014 - Seth Cohen tallied a hat trick as AEN Asphalt rolled over Sabilia Law Firm. Giving Danny Klarmann the start in goal, Nico Zarrillo made his league debut as a forward and also cashed in with a hat trick while Greg Felber added 2 goals and an assist. Other highlights include Justin Maryeski's 2 goals, 3 assists as Navy defeats River Rats, Chris Giacomazzo's hat trick in Crystal Rock's win over Voodoo Grill, Chris and Brian Discordia combining for 10 goals as Giuliano's Bakery downs EBAC and AJ Ray with 2 goals, 5 assists in Sound Home Builders win over Carl's Cronies. 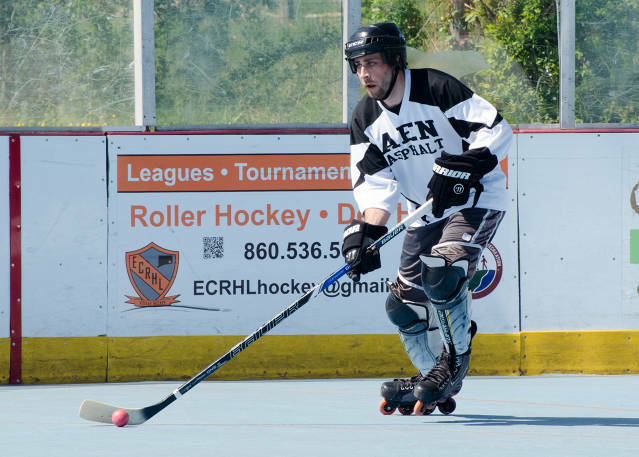 October 5, 2014 - Max Kneeland's hat trick led the offense as AEN Asphalt rolled over Carl's Cronies. Chris Turner contributed with 2 goals and an assist and Seth Cohen contributed with 2 assists. Other highlights included Blake Biancomano's 4 goals in Giuliano's Bakery's win over River Rats, James Baker's 2 goals, 3 assists as Sound Home Builders shut out Voodoo Grill, Chris Serano tallied 3 goals, 4 assists in EBAC's win over Sabilia Law Firm, and Colby Castro's 4 goals, 1 assist in Crystal Rock's win over Navy. 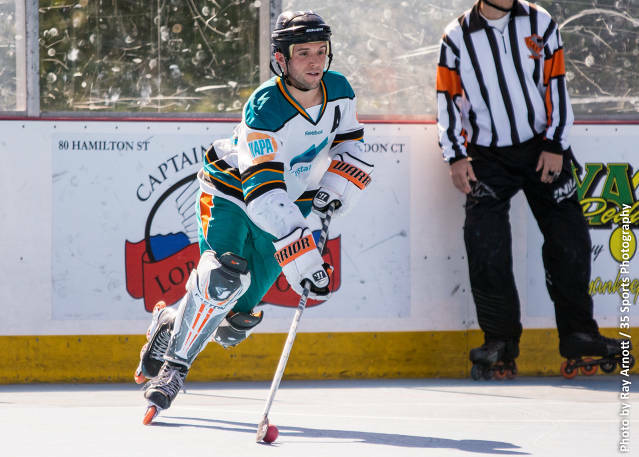 September 21, 2014 - Team Captain Josh Lecy picked up a goal and two assists, leading the River Rats over Sabilia Law Firm. Geoff Moores contributed with 2 goals while Dan Morrisey and Rich Barth each had a goal and an assist. Other highlights include Josh Chouinard's goal and two assists in Carl Cronies' win over Voodoo Grill, Greg Felber tallying a hat trick and assist in AEN Asphalt's win over EBAC, AJ Ray's 4 goals as Sound Home Builders sink Navy, and Kyle Manuilow stops 26 of 27 shots as Giuliano's Bakery defeats Crystal Rock. September 14, 2014 - James Baker's hat trick and assist led the way as Sound Home Builders defeated Giuliano's Bakery. Colin Morgan added two goals while Tim Konalski and AJ Ray each contributed with 2 points each. Other highlights include Rob Cacchiola stopping 16 of 17 shots as Navy sinked Voodoo Grill, Max Kneeland's hat trick plus assist in his season debut as AEN Asphalt defeated River Rats, Sawyer Hamblin collected a hat trick as Carl's Cronies edged EBAC, and Joe Forte with 4 goals and 4 assists as Crystal Rock defeated Sabilia Law. 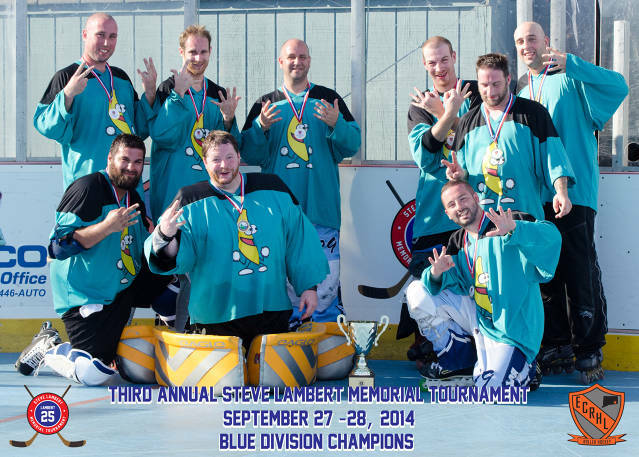 September 28, 2014 - The Banana Hammocks, one of three teams from the Eastern Massachusetts Roller Hockey League, claimed the Blue Division championship of the Third Annual Steve Lambert Memorial Tournament. The Banana Hammocks finished the qualifying round at 2-4-0, but posted wins against Voodoo Grill in the semi-finals and Sofa King Good in the finals to win the division. Congratulations to Captain Matt Zecchino, Liam Spinicci, Kevin McGovern, Brian Estrella, Chris Spuglio, Ryan Hayes, Steve Burdick, Randy Cipoletta, and Tommy Grasso. 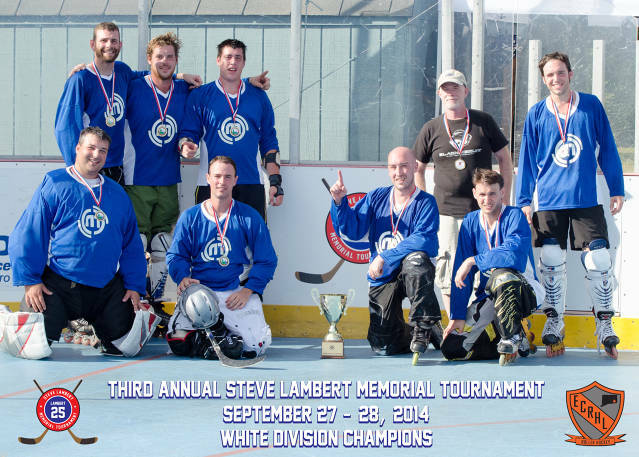 September 28, 2014 - The Drunken Pirates took a perfect 8-0-0 record to the Third Annual Steve Lambert Memorial Tournament White Division championship. This championship is the second for the Drunken Pirates, who showed why they were the team to beat going into the tournament. Congratulations to Rob Cacchiola, Chris Turner, Tommy Eshenfelder, Glen Reilly, Max Kneeland, Chris Degan, Coach Danny Klarmann, Joe Drouillard, and Joe Forte. September 19, 2014 - Registration is complete and the stage is set for another great weekend of hockey. 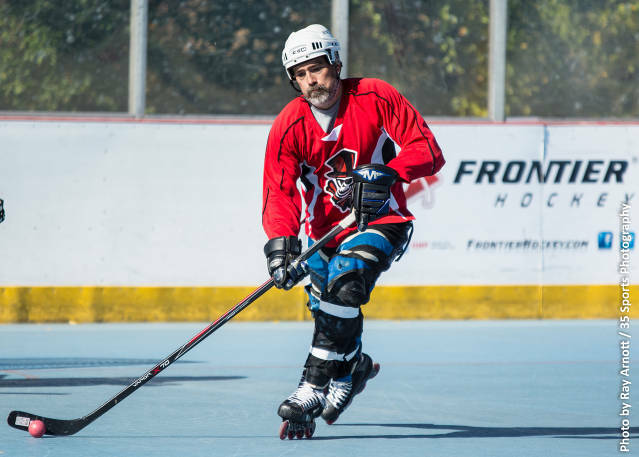 Three teams from Eastern Massachusetts and one team from South County, Rhode Island will join the hosting Shoreline Express, and three teams from the ECRHL ranks in this two day event in honor of former Express captain and Groton hockey alum Steve Lambert. The complete schedule is available by clicking on Forms in the left menu. Games begin each day at 8:30AM, and family and friends are invited to join us. The Navy's Silver Dolphins Drill Team and Color Guard will perform on Sunday and Tabatha Mills will perform the National Anthem prior to eliminations. The Rolling Tomato will also be returning with their mobile pizza trailer on Sunday between 11AM and 1PM. September 7, 2014 - Justin Maryeski (3G, 2A) and brother Theo Maryeski (2G, 3A) combined for 10 points as Navy defeated Carl's Cronies 9-1. Robert Cain added a goal and an assist, and Robert Cacchiola stopped 16 of 17 shots for the win. Other Week 2 highlights include George White's goal and assist as River Rats edged EBAC, Jon Tatum's goal and assist as Crystal Rock defeated AEN Asphalt, The Discordia Brothers' hat tricks as Giuliano's Bakery defeated Voodoo Grill, and James Baker with 6 goals and 2 assists as Sound Home Builders downs Sabilia Law. 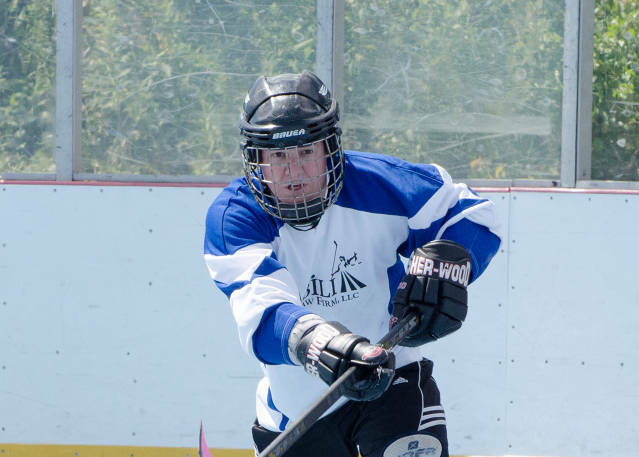 August 24, 2014 - The ECRHL welcomed Sabilia Law Firm as the newest team to join the Sunday Ball League. Although it wasn't the debut Sabilia hoped for, their addition to the league represents a 66% participation growth in less than 2 years. Other highlights include Andrew Peck's late 3rd period game winner as Carl's Cronies edged River Rats, Greg Felber's hat trick plus assist as AEN Asphalt doubles up Sound Home Builders, Colby Castro picks up a hat trick plus assist as Crystal Rock rolls over EBAC, and Brian Discordia's 5 goals, 3 assists as Giuliano's Bakery defeats Navy Silent Snipers. 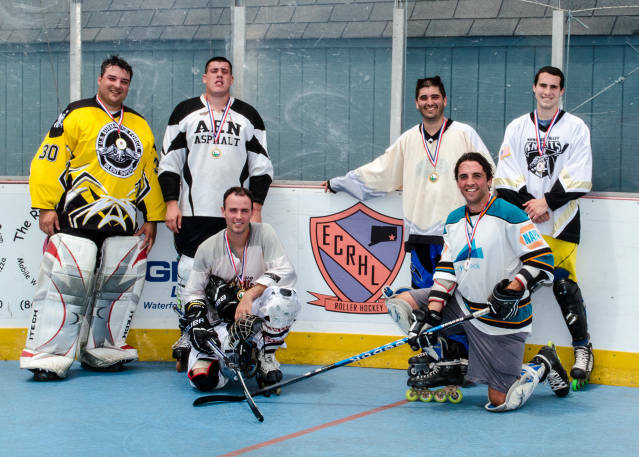 July 26, 2014 - Y.M.G.B., drafted by Matt McLoughlin, wins the second ECRHL Draft Tournament. L-R, Rob Cacchiola, Max Kneeland, Glen Reilly, Brandon Cline, Matt McLoughlin and Brett Kelly. June 29, 2014 - Giuliano's Bakery captured the Spring 2014 Sunday Ball League championship with a 10-0 defeat of the defending champions AEN Asphalt. 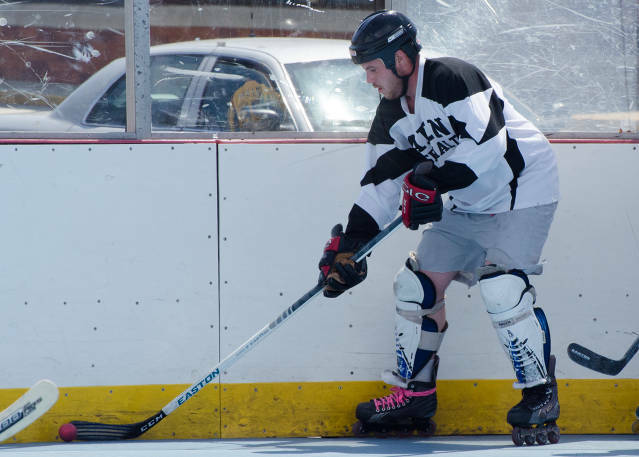 The win was the first under the ECRHL and sixth overall Groton Hockey championship. 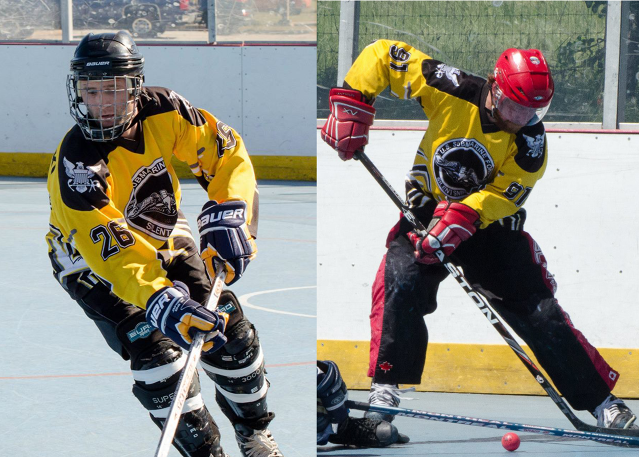 Brian Discordia led Bakery with 5 goals and 4 assists and Chris Discordia tallied 2 goals and 2 assists. Kyle Manuilow made 12 saves for the shutout victory. 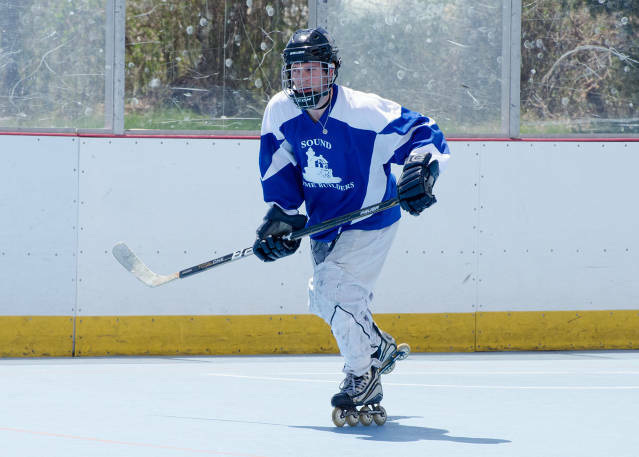 June 29, 2014 - In the opening game of the Spring 2014 Sunday Ball League playoffs, Theo Maryeski tallied 4 goals, including the first three goals of the game as (4) Navy Silent Snipers downed (5) Crystal Rock. The 10:00AM game saw AJ Ray lead (3) Sound Home Builders into the semi-finals over (6) Carl's Cronies with 2 goals and 2 assists. 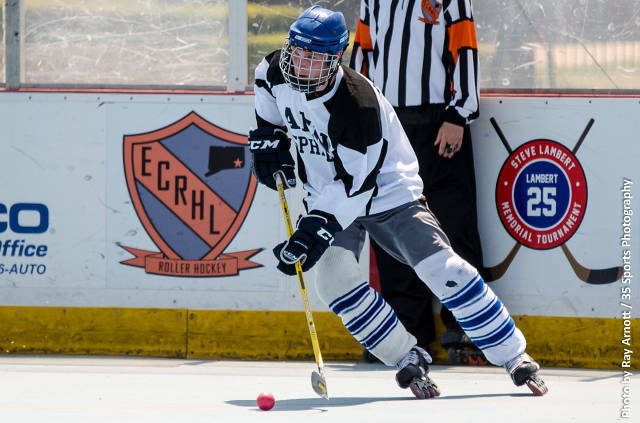 The first semi-final matchup was led by Peter Eshenfelder's 2 goals and 1 assist as (1) AEN Asphalt defeated (4) Navy Silent Snipers. (2) Giuliano's Bakery punched their ticket to the championship game over (3) Sound Home Builders with 4 goals and an assist from Chris Discordia. June 22, 2014 - After trailing Crystal Rock by 3 goals two and a half minutes into the 3rd period, AEN Asphalt launched an epic comeback, led and capped off by a hat-trick clinching, stick-breaking, come from behind game winning goal from Tom Eshenfelder with only 26 seconds remaining in regulation. Max Kneeland chipped in two assists, and Nico Zarrillo made 24 saves for the victory. Other highlights include Chris Simpkins leading a revamped and proud Carl's Cronies team back to the playoffs, Joe Drouillard scoring two goals as Navy clinches the 4th seed with a win over EBAC, and James Baker's goal and two assists as Sound Home Builders edges out a win against a valiant effort from River Rats. June 15, 2014 - Needing wins in their final two games, Voodoo Grill accomplished the first half of that task by defeating Carl's Cronies. Sloan Arnold led the way with 2 goals and 1 assist while Shawn Prevost provided solid defense on top of his 1 goal, 2 assist effort. Dave Baskin tallied a goal and an assist. Subsitute goaltender Danny Klarmann bailed Voodoo out of a last minute scramble to find a netminder and made 5 key saves in the victory. Other highlights include Chris Turner scoring 2 goals in 50 seconds as AEN Asphalt edged Crystal Rock, Tyler Hailing collecting the hat trick as Sound Home Builders upset Giuliano's Bakery, Elias Leon's 5 goal, 1 assist outburst as EBAC defeats Navy, and James Baker picking up 4 goals and 3 assist as Sound Home Builders goes 2-0 on the day, defeating River Rats. 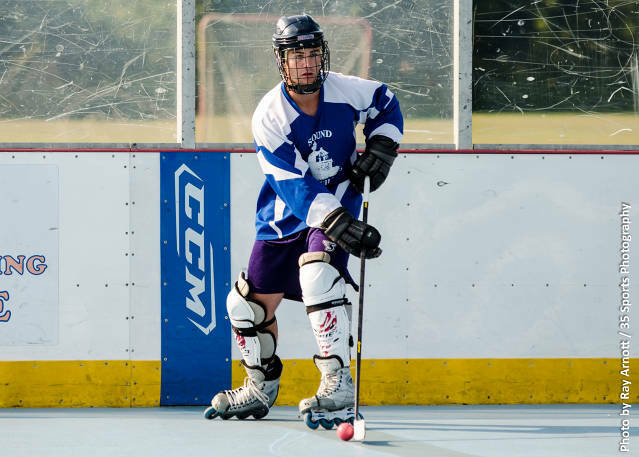 June 8, 2014 - Justin Maryeski picked up a hat trick and added an assist as Navy Silent Snipers defeated Carl's Cronies. Anthony Cubbage collected 2 goals, including the game winner. Rob Cacchiola stopped 13 of 14 shots his way, moving Navy to a 5-3 record on the season. Other highlights include Jeff Estrella and Nate Gedney each collecting 2 goals as EBAC downs Voodoo Grill, Chris Turner's 2 goal, 1 assist effort as AEN stays perfect in regulation with a win over River Rats, and Brian Discordia scoring 3 goals and an assist as Giuliano's Bakery maintains first place with the win over Crystal Rock. 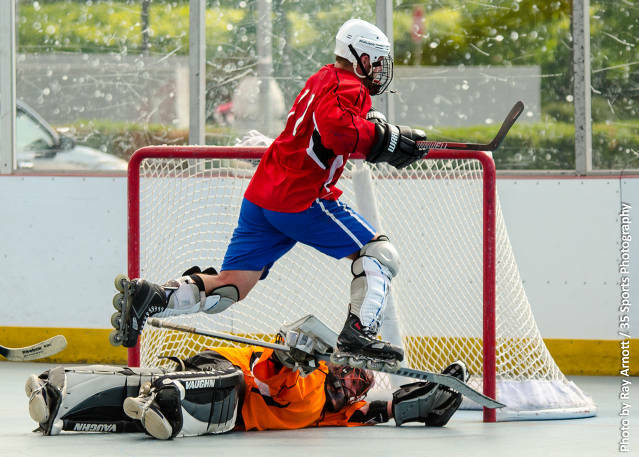 June 1, 2014 - Giuliano's Bakery's Chris Discordia closed out his hat trick in dramatic style, capturing the overtime winner over AEN Asphalt in a see-saw battle between the first and second place teams in the Sunday Ball League. With the win, Giuliano's Bakery jumps into first by a single point, with AEN holding a game in hand. Other highlights include Chris Drakos scoring 2 goals in the 3rd period to put Sound Home Builders over EBAC, Carl's Cronies erasing a 2 goal deficit to defeat River Rats, and Justin Maryeski and Joe Drouillard tallying 2 goals and an assist each as Navy Silent Snipers sink Voodoo Grill. May 18, 2014 - Joe Forte ended a 5 game goalless streak in a big way, talling 4 goals in Crystal Rock's rout of River Rats. Matt McLoughlin contributed with a hat-trick, Garrett Boehm (1G, 4A) picked up 5 points, and all 9 skaters contributed to the scoresheet. Other highlights include James Baker and Chris Drakos both collecting 4 points each as Sound Home Builders defeated Carl's Cronies, Max Kneeland picks up 3 goals and an assist as AEN Asphalt stays perfect on the season with their win over Voodoo Grill, and Brian Discordia picks up the hat-trick as Giuliano's Bakery doubles up EBAC. 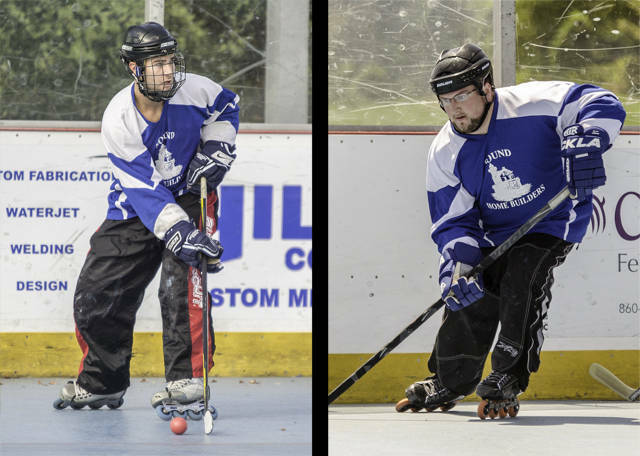 May 11, 2014 - The Navy Silent Snipers debuted their brand new jerseys and put a win into them by defeating Sound Home Builders 9-4. Theo Maryeski contributed with 2 goals and an assist while Robert Cain and Brandon Whitten each tallied 2 goals. Navy netminder Rob Cacchiola made 28 saves to pick up his 3rd win of the season and move his team to .500. Other highlights include Chris Giacomazzo and Brian Zeccola scoring 2 each in Crystal Rock's shutout win over Carl's Cronies, Peter McMorris' 4 goal game for Giuliano's Bakery in their blanking of River Rats, and Max Kneeland turning in a 5 goal showing as AEN stays perfect on the season with their win over EBAC. 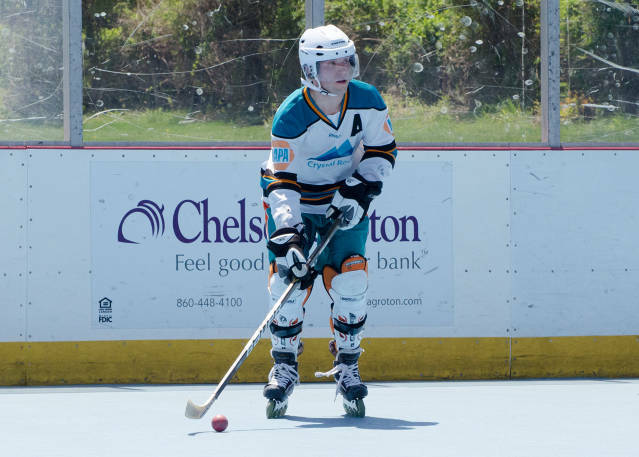 May 4, 2014 - James Baker tallied 4 goals, including his first just 25 seconds in, followed by his second 55 seconds later, as Sound Home Builders doubled up Crystal Rock 8-4. Tyler Haling added 2 goals and 3 assists and Tim Kolnaski picked up a goal and an assist. Other highlights include Chris Discordia talling 6 goals and 3 assists, including a 2nd period natural hat trick in Giuliano's Bakery's blowout of Voodoo Grill, Mike Miller picking up 2 goals including the game winner in the River Rats win over EBAC, and Pete Eshenfelder collecting the hat trick and an assist as AEN moved to 4-0 with their win over Navy. 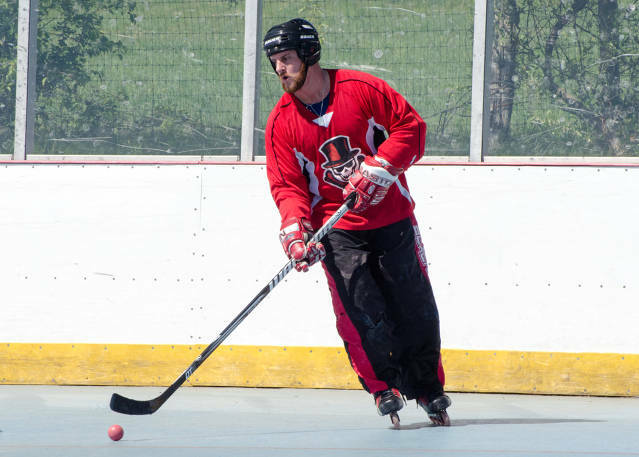 April 27, 2014 - Brian Discordia made his season debut in style, picking up 6 goals and 2 assists while brother Chris tallied 3 goals and 4 assists in Giuliano's Bakery's 13-3 win over Sound Home Buliders. Peter McMorris also picked up a hat trick with his 3 goal, 2 assist effort. 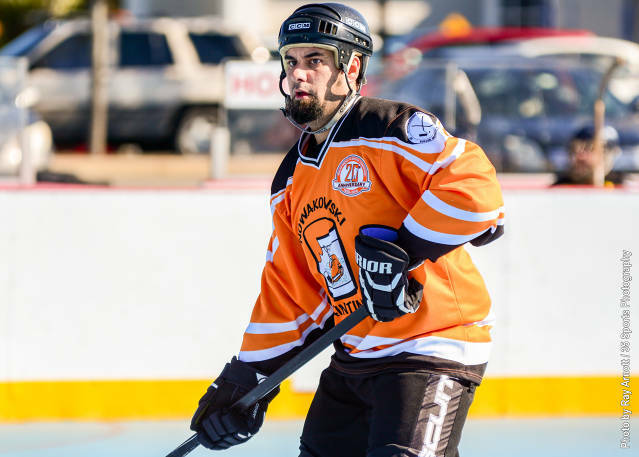 Other highlights include Craig Stedman recording the first shutout in River Rats team history against Voodoo Grill, the Eshenfelder brothers combining for 3 goals and 5 assists in AEN Asphalt's win over Carl's Cronies, and Crystal Rock holding off a 3rd period comback attempt by Navy Silent Snipers. 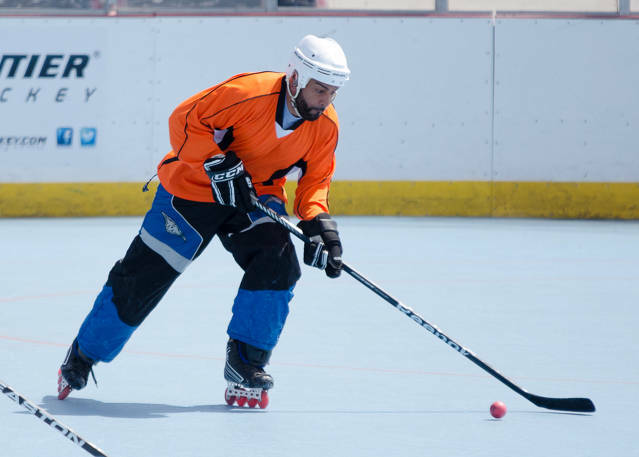 April 19, 2014 - The Infidels, drafted by Colby Castro, won the ECRHL's first ever draft tournament. The team consisted of (L-R) Dean Patty, Chris Turner, Max Kneeland, Casey Mumblow, Colby Castro and Garrett Boehm. April 17, 2014 - Team captains Jeff Jodoin, Colby Castro, Joe Drouillard and Commissioner Arnott drafted the four teams participating in Saturday's First Ever ECRHL Draft Tournament. Several draft strategies were implemented, including a late draft trade, all of which are governed by a strict code of secrecy. All players must bring a dark and white based jersey and are asked to arrive by 8:30AM to complete roster waivers. VD and Snubs will play at 9:00AM, followed by El Diablo vs Infidels. A complete schedule will be posted at the rink Saturday morning. April 13, 2014 - After losing their last two matchups, including the first round of the Fall playoffs, Crystal Rock dominated Voodoo Grill, led by 4 goals from Chris Giacomazzo. Garrett Boehm contributed with a goal and 3 assists and Colby Castro tallied 2 goals and 1 assist. Other highlights include Giuliano's Bakery surviving a 3rd period comeback effort from Navy, a hat trick from AEN's Max Kneeland in their win over Sound Home Builders, and a late 3rd period game winning goal from Joe Haskins, giving Carl's Cronies the win over EBAC. 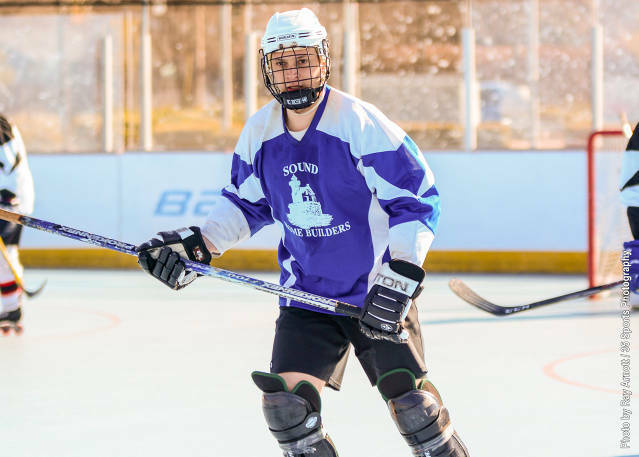 April 6, 2014 - The Sound Home Builders, a team name rich in Groton Hockey history, made their ECRHL debut in historic style with an overtime victory over Voodoo Grill. James Baker (3G, 1A), Tim Kolanski (pictured above, 1G, 1A), and Keith Drakos (1G, 1A) led the charge over their former team. Voodoo Grill forwards Brian Flynn and Sloan Arnold both tallied 2 goals and 1 assist in the losing effort. Other highlights include a shutout for Giuliano's Bakery goaltender Kyle Manuiloco in his team's rout of Carl's Cronies, Navy moving to 2-0 with a win over River Rats, and a 27 save shutout win for EBAC's Brian Tomasetti over Crystal Rock. 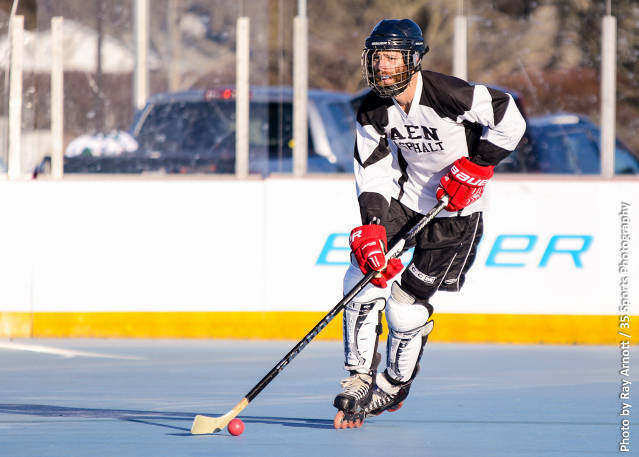 March 23, 2014 - AEN Asphalt continued to be red hot in the frigid cold, picking up where they left off in November with a dominating win over the River Rats. Max Kneeland started the title defense with 5 goals and 3 assists, while Seth Cohen and Chris Turner each turned in a goal and two assists. Other highlights included a 23 save, 4-2 win for Voodoo Grill's Garreck Seales over EBAC, Navy doubling up Carl's Cronies with a 4-2 win, and Crystal Rock using 4 different goal scorers to pick up the 4-2 victory over Giuliano's Bakery. 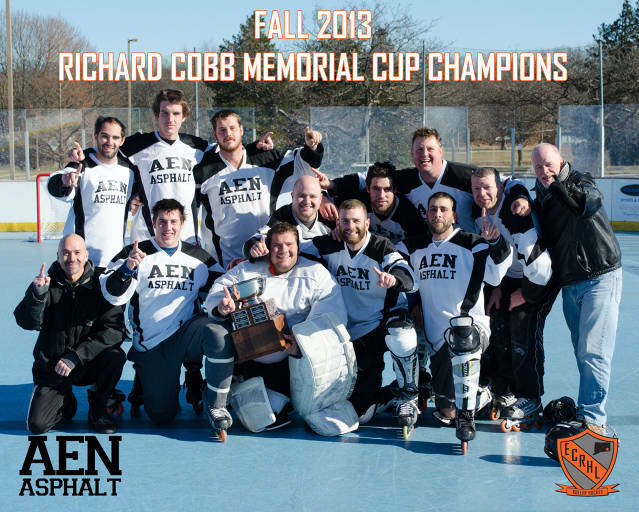 November 24, 2013 - AEN Asphalt used a 5 goal outbust in the 3rd period to secure their first Groton hockey championship over the heavily favored Carl's Cronies. Tom Eshenfelder and Greg Felber each had 2 goals and assist while Max Kneeland contributed a goal and an assist. AEN also relied on their defense, allowing only 14 shots on goal against a Carl's Cronies team, undefeated up to this point, who produced 92 goals in 10 regular season games.